On the flight from Houston to Leon, Mexico, I felt as if I were in an updated episode of “I Love Lucy.” The flight attendant was so ditzy that I couldn’t believe she could make the grade to have her job. On reflection, I’m thinking that maybe she was a last-minute fill-in for someone who called in sick. She knew only about 10 words of Spanish, and half of them she butchered. It seems to me that if you are running a flight from one country to another, it is your duty to have a flight crew that speaks the language of both countries fluently. Indeed, half of the passengers on the flight were Mexican. The first thing that happened was that there were more pieces of baggage than there were passengers. Our flight attendant said that, in her 10 years working this job, it was the first time this had ever happened on one of her flights. She counted us innumerable times, always coming up with the number 42, while the baggage count was 43. Finally, she took roll, and discovered that, while he checked his baggage onto our flight, a John Young was missing from his seat. This was now a security issue. All of the luggage had to be taken off of the plane and matched against the passengers who had boarded. While this was going on, John Young appeared (it was now at least 10 minutes past our scheduled take-off time) and slunk to his seat. The flight attendant told him that he had been paged for at least the last ten minutes. Maybe he had been asleep or in a bar. About 10 minutes after that, a little, old Mexican couple boarded. They were in luck that day, because if it hadn’t been for the tardiness of Mr. Young, the flight would have left on time and they would have missed it. As we finally taxied away from the gate, a single black suitcase, with its tag blowing in the breeze, was left on the tarmac. Was it Mr. Young’s? Were the baggage handlers not told that Mr. Young had boarded and that they should put his bag back on the plane? I guess that was his punishment for causing all of us and the airline delay, trouble, and worry. The attendant kept me amused for the entire flight. I frequently laughed out loud at her antics. In addition to all of the usual services she provided — and being the only attendant on the flight for 45 people — she had to give out and explain several Mexican immigration forms. I felt that she was pretty overwhelmed. I’ve been renting the same place for a couple of years now — and hope to be able to continue here for years to come — and my only complaint is that the unit is somewhat over-decorated. I’ve put up with way too many tsotchkes for too long. I had decided at the conclusion of my fall stay that when I returned, I would simplify the decor more to my liking. 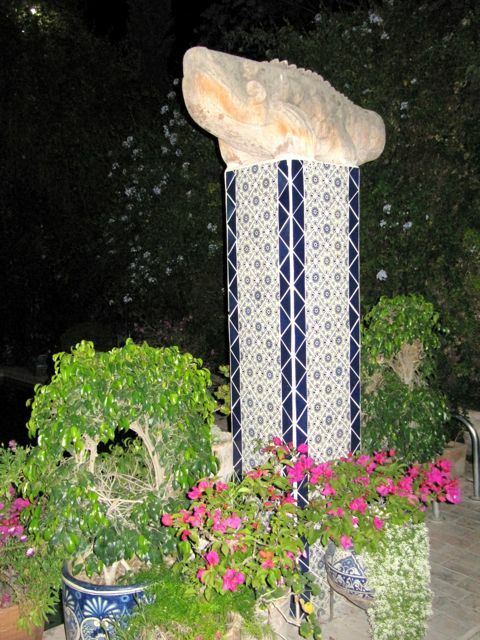 Actually, I went on a mini-rampage, swooping up all manner of knick-knacks and removing paintings from stone columns to reveal the beauty of the stones beneath and make me feel much calmer. I realized what I was doing: I was making it my home and not just a rental. When my maid arrived, I explained that I had a different aesthetic from Heather, my landlady (and her employer), and needed to make things simpler and less cluttered, and she totally got it. We packed up everything in boxes and put them away in a closet. Aaaah! I wasn’t really expecting to go out and do anything cultural that first day after my arrival, as I had much to do, what with continuing to unpack and getting food into the house from at least four different places, but while flipping through the Atención newspaper while having my lunch on the balcony, I noticed that at 3 p.m., there was the second and final screening of a Reel Docs film called “Leave ‘Em Laughing.” The Reel Docs series is curated by two SMA friends who bring extraordinary documentaries to audiences here, always with a bonus of the director or an actor in the film present for a Q&A session afterwards. This time the associate producer, who was also a friend of the person featured in the film, Carla Zilberstein, answered our many questions after we watched a painful, sad, but also sometimes truly hysterical and in the end life-affirming documentary about the end of life from ALS of a very spunky woman — a nationally-known performer of ballads, skits and self-parody, in some reviews compared to Lily Tomlin, her wise-beyond-his-years teenaged son, her totally supportive and loving father, and a group of wonderful gal pals. 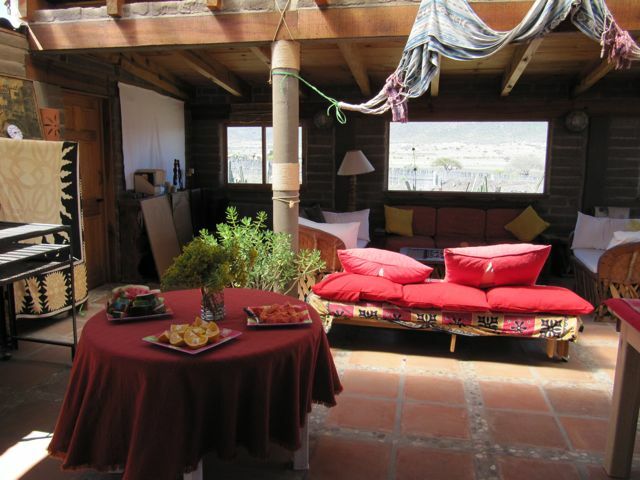 Again, a peak experience in San Miguel. Check her and the movie out online. It’s not available on Netflix right now, but if you ever get a chance to see it, do. The front page news in last week’s Atención was that prices are up for 2012. The loss of value of the peso against the dollar, a hike in the price of gasoline and propane, and the worst drought in the country in 70 years are some of the contributing factors. The latest exchange rate of 13.08 pesos to one US dollar is very good for us tourists (the standard used to be 10 pesos to the dollar, which certainly made figuring out how much things cost in dollars a whole lot easier than now), but bad for Mexico. One raise in prices that will hit the tourists hard is that of taxi fares. We used to pay a fixed price of 25 pesos during the day and 30 at night for trips within the city limits, but now it’s 30 in the daytime and 40 at night, although last night, coming home from a stupendous performance of “Master Class,” I was charged only 25 pesos, so who knows what’s going on. Another interesting article told how SMA will now spend its advertising budget within the country rather than abroad since the number of tourists from within Mexico is increasing exponentially, while the number of Americans is falling fast. The Canadians are still here in droves, perhaps because their economy is not in the shambles that ours is, and because their media have not played up to such a degree the narco violence along the border. It’s been wonderful to connect with many of the people I remembered from past winters here. There was even a friend on the flight from Houston to Leon. And I’ve already met several new folks. Some friends from last year and even just last fall have become ill while I’ve been away, and of course that is distressing. Sorry that there are not any photos to enliven this dispatch, but I’ve only been in town for four days now, and although it seems like I’ve been here a month, I haven’t had the time or the opportunity to take any photos. I’m sure that will be remedied soon. Thought I’d start out with a chuckle. I was in the Bagel Cafe recently picking up some food for a house-bound friend, when I spotted this strange juxtaposition on the menu board. 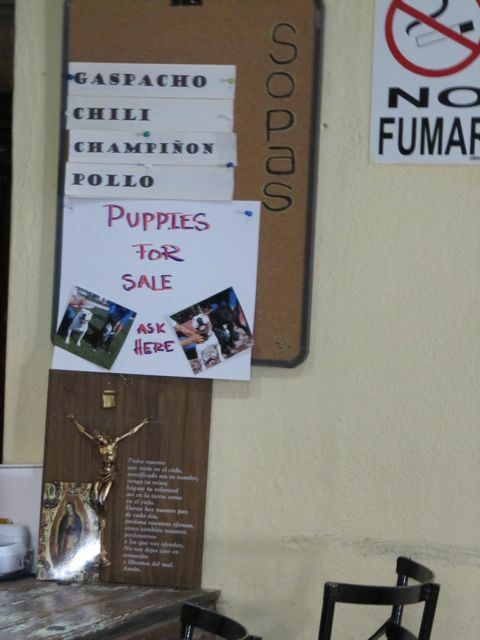 They’re offering chili, and gazpacho, mushroom, and chicken soups, and right below, informing all that they have puppies for sale. Hurry and buy them is my advice before they appear on the menu. (Just kidding, of course!) And below are Jesús and La Virgen de Guadalupe, just for good measure. I’ve been uncharacteristically non-communicative, as I’ve been crazy busy and also not doing anything for the first time, thus not really having anything new to report. But now I do. First I’ll catch you up on something that started just before I left in December, and which resolved itself recently. It seems that McDonald’s had gotten a permit to put up an outlet right in El Centro, steps from the jardin and the parroquia and smack-dab in the middle of the most historical district. The catch was that the name “McDonald’s” appeared nowhere on any of the application forms. Somehow the word got out and the town went nuts. First, this sticker was affixed to the building, halting work. Then, the demonstrations against such a restaurant in SMA began. The first one was the evening before I was to leave. It was fairly small at that point, but had about an equal number of gringos and Mexicans. We totally blocked the street traffic, and to my complete surprise, the police allowed us to do that, and re-routed the cars. At one point, a police officer came walking down towards us, and somebody said, “Don’t move.” I responded that I was leaving the next morning and if a Mexican police officer asked me to move, I was darned well going to move. Actually, foreigners are not permitted to participate in any political demonstrations, but I didn’t think this matched that criteria. A friend of mine captured the entire demonstration on his iPad, plus some interviews with local activists, and since his ex-sister-in-law worked for Spanish CNN, the cause got good coverage. 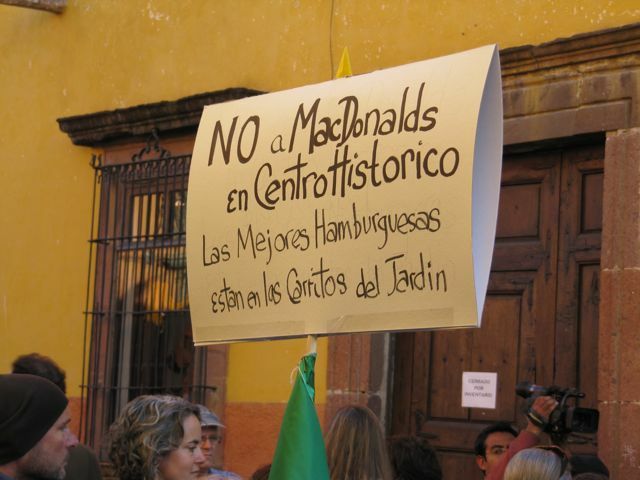 This extremely articulate Mexican woman laid out our case against the invasion of McDonald’s. As a UNESCO World Heritage site, there was fear that SMA might lose its designation, although that didn’t happen with Starbucks. Evidently, if the exterior of the building is not compromised, you’re OK. There was worry, also, about the obesity issue, as Mexicans are the second fattest nationality, after those in the USA. And it’s not as if you can’t get a Happy Meal anywhere in SMA. On the outskirts of town, in a shopping mall, there is a McDonald’s. I’m sure you can translate this even if you don’t know any Spanish. Well, the demonstrations continued every Wednesday evening at “rush hour” in my absence, and there were articles in the press, etc. The whole thing collapsed (or succeeded, depending on the viewpoint) when the City Councilperson who had allowed the permit to go through was forced to resign, and McDonald’s quietly slunk away. Hoorah! Power to the people! Just before I left for home, I went for a haircut, since they cost a small percentage of what I pay in Philadelphia, and here is the sight that greeted me in the magnificent salon of my hairdresser, José Marín. I was dumbstruck. He told me that he had made all of the tree decorations himself. 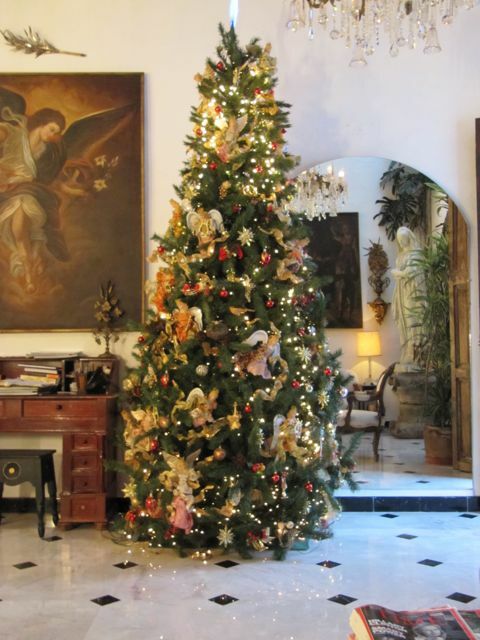 The tree itself is fake, BTW, and 19 years old, but I think it still looks just great. 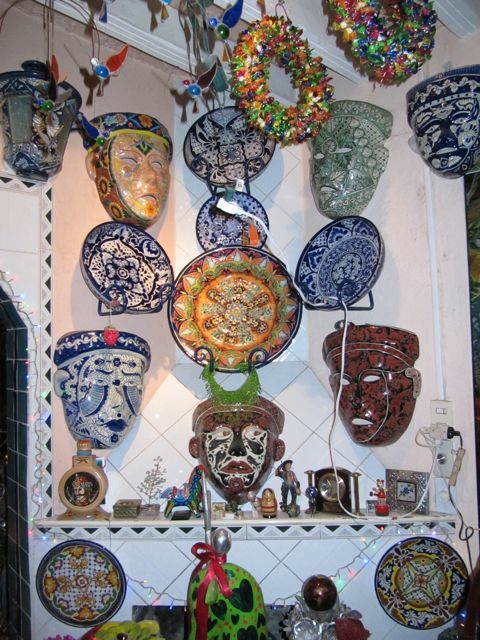 He said he had bought the bisque heads and hands, and the instruments, but fashioned everything else himself. I was horrified to read on a daily post I get from Philadelphia magazine that “the City of Brotherly Love” (ha!) has been re-named “Kill-a-delphia,” since in 2011 it had the highest homicide rate of the 10 largest U.S. cities. And in the first 25 days of January, 31 people were killed. And people worry about me here in Mexico? Now I have some (you’ll pardon the un-intended pun) “ammunition” when people start up with me on that issue. Since I plan to be in SMA a hefty part of each year into the foreseeable future, I have decided to join the 24-Hour Association. 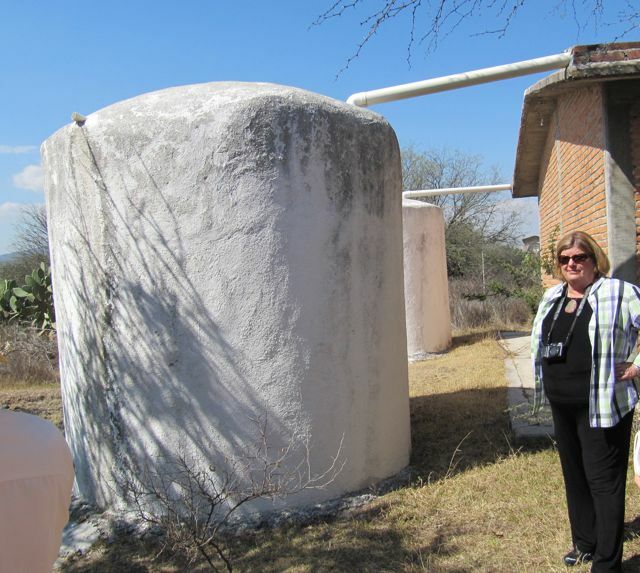 There is a law in Mexico that all dead bodies must either be in the ground or cremated within 24 hours. For a foreigner, negotiating this and getting a death certificate are almost insurmountable hurdles. 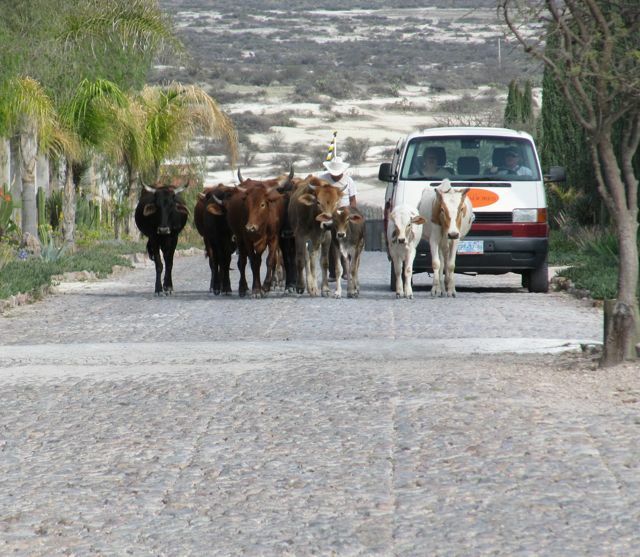 And if you factor in grieving relatives trying to get to Mexico on a moment’s notice, the scenario is hellish. Enter the 24-Hour Association. This is a volunteer organization that keeps up with the Mexican laws and rules surrounding death, and can arrange for any type of burial, cremation and resting place of final remains that one might want, and know how to get the all-important death certificate out of authorities here. The best part is that there’s only a one-time fee, the amount depending on whether you are to be buried or cremated, your remains put into an urn for your survivors, or put into a niche in a cemetery here. If you should die outside of Mexico or stop coming to SMA, the total fee is refunded! It’s a win-win. I won’t be able to fill out and and turn in the necessary forms until I return next fall, as I’ll need an official “raised seal” copy of my birth certificate (which may or may not have to be translated here, depending on the ever-changing rules) and a copy of my legal change-of-name to eliminate my middle name of “Louise,” as shown on my birth certificate, so that it matches my passport name. But it will bring me peace of mind, and will be a gift to my children. We’ve been having some not-so-great weather here over the past two weeks. There have been a few perfect, sunny days, of course, but they’ve been interrupted by heavy downpours (which are all to the good, as we’re in a severe drought situation here), thunder and lightning, and then grey, cold, damp days and nights. None of this is in any way “normal,” whatever that means these days in the weather department. 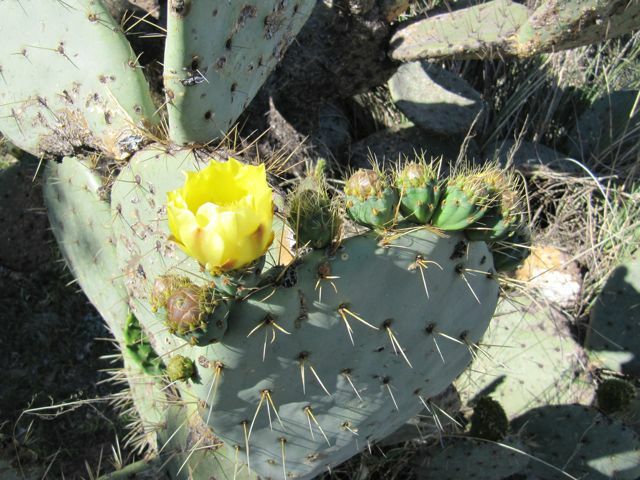 As my friend Sybille here said in her daily e-mail blast yesterday, ‘It is on cool gray days like these, without even a hint of sun, when one is reminded that San Miguel sits about a mile above sea level in the central mountains of Mexico. It is NOT a semi-tropical beach town.” But today the sky is cerulean, the sun beginning to thaw us out, and my sagging spirits have lifted. The Center for Global Justice here runs frequent trips. You may remember a very informative one I took some years ago to a highly-successful cooperative organic tomato farm, which I very much enjoyed. So when I read in Atención of the Center’s trip to CEDESA last Saturday, I signed up. CEDESA is an acronym for Centro de Desarrollo Agropecuario (“dessarrollo” means development, but the last word isn’t in my dictionary, and it really doesn’t matter), and is located about an hour away in Dolores Hidalgo. 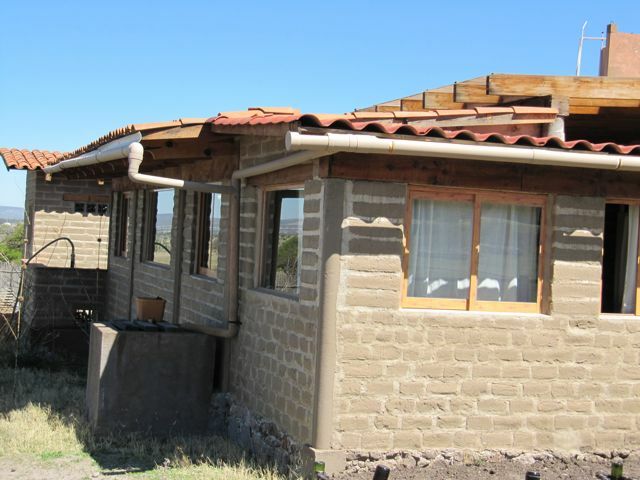 It is a rural training center which is constantly incorporating new, low-cost technologies into its repertoire of ecological, sustainable practices which help the surrounding peasant communities not only with bee keeping and organic agriculture, but also teaches them how to build and use dry toilets, recycle grey water, catch rain water, build cisterns, and compost. As you can see, many of these technologies focus on saving water, as lack of water has always been a problem in that area. About 16 of us started out in a large room where we eventually had our lunch, which also housed displays, chairs, and a TV screen. We watched a 15-minute DVD, with English sub-titles, that told the story of how CEDESA got started. It grew out of liberation theology. The story of the community was divided by decades. 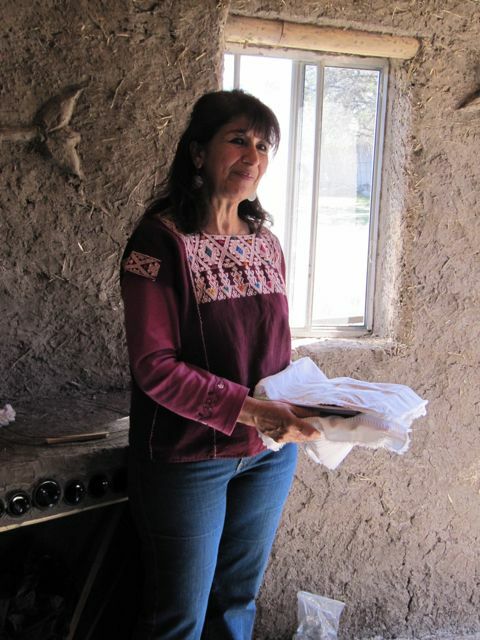 In the 1960s, the federal government had no interest in Dolores Hidalgo. 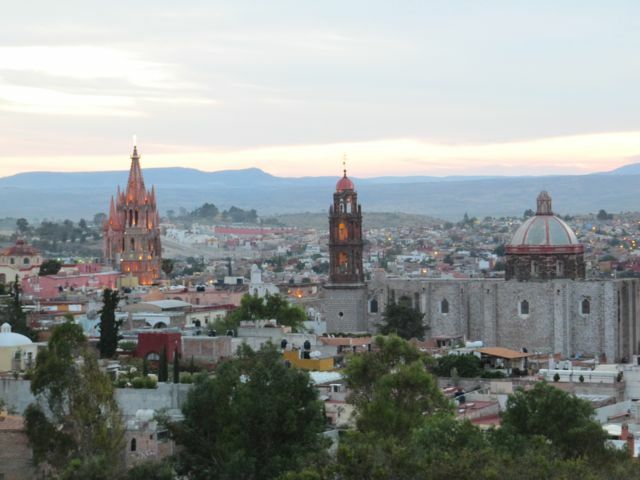 It is the poorest area in the state of Guanajuato. There was no ejido there (collectively-owned land, which came about as a result of the Mexican Revolution 1910-ending date disputed; latest shown is 1929). The campesinos worked barefoot for big bosses, and had no money and even less power. Father Nemo (the nickname for Guillermo) had been sent to the region in the early 1970s to offer mass to isolated indigenous communities. He soon realized that the people needed more than just God; in this life they needed land and a way to be self-sufficient, and they shouldn’t have to wait until the next life for something better. He taught the person as subject, not object, that the people should take the initiative, be agents of their destiny. Father Nemo taught literacy (the rate of illiteracy at that time was 95%), opened schools, and preached the dignity of being human and the dignity of human work. 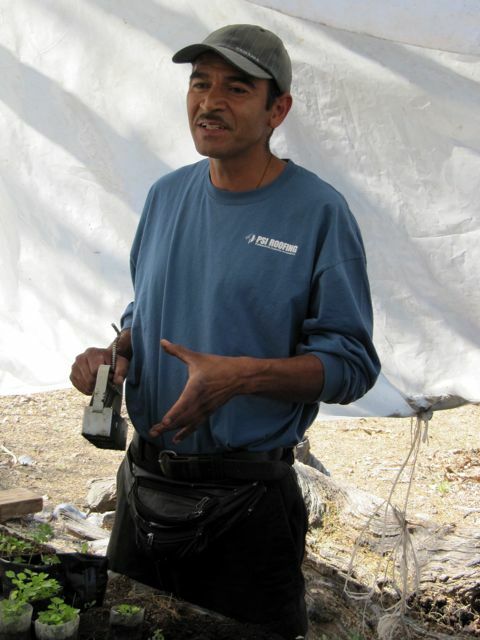 He was soon joined by several of his women students, who have remained with CEDESA over these many years, teaching campesinos. These women were key in developing the program. One of these women, now 62, was part of the group which welcomed and taught us, and said she had been with CEDESA for 50 years. During the 70s, Father Nemo concentrated on the construction of the social base. 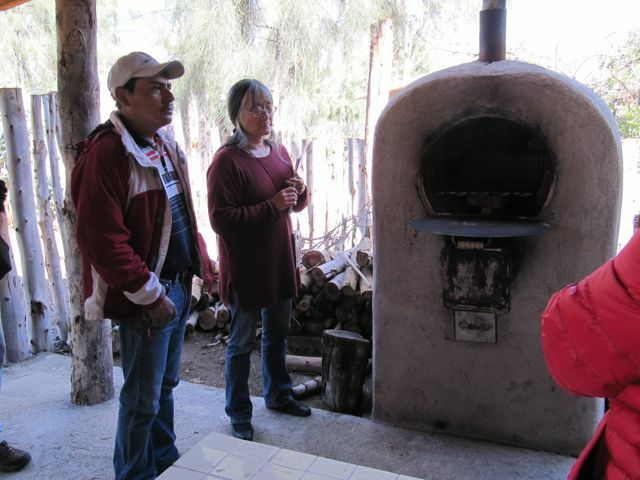 Also during this time, thanks to Mexico’s agrarian reform, which finally reached northeast Guanajuato, local campesinos got collectively-owned land and were able to survive by making cactus and apiary products, taught to them by the folks at CEDESA. 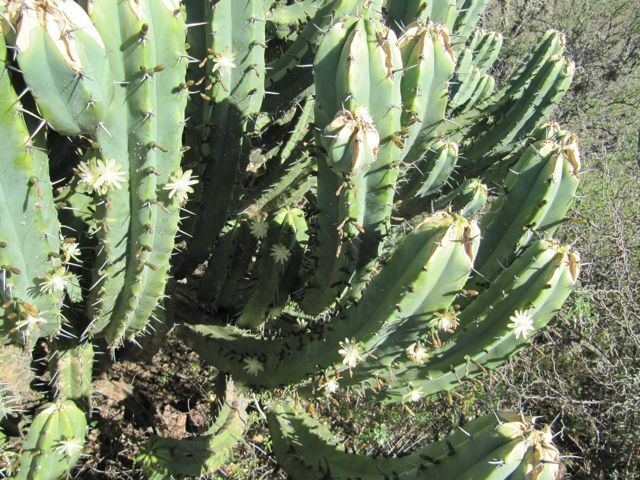 The proceeds from the sale of these products and adopting low-tech ecological practices taught by CEDESA, have enabled them to resist pressures to send family members to El Norte or to sell land. In 1979, Father Nemo was forced out by the church (some believe that the big land-owners pressured the church to do so), but with CEDESA in the hands of the women — many of their men were in the US working — they took care of the land and supported the project without any outside help. From 1980-92, a community assembly was mobilized to make decisions and the communities began to work together. At this point, the women were worn out by 10 years of fighting for land and water, and in 1993, they evaluated where they stood. In 2000-06, they taught autonomy by teaching the construction of backyard gardens using eco-technologies that used the least amount of water. 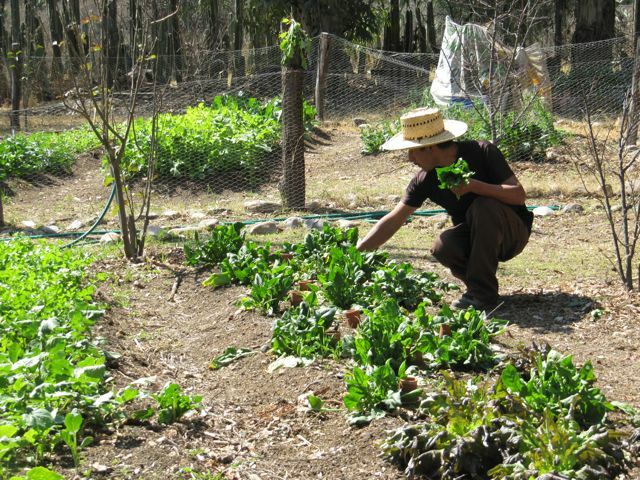 Ecological farming supplemented the backyard gardens. It was very surprising for me to learn that these people had to be taught to create backyard gardens. One would think that it would be instinctual or a part of their heritage, but that was not the case. 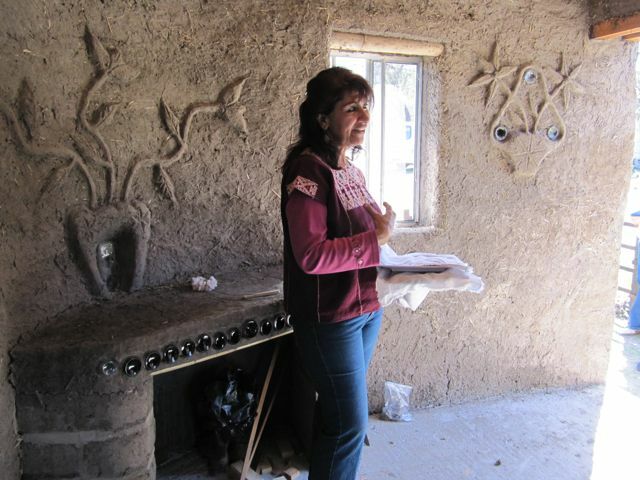 They created a brand, La Tierra Generosa, “The Generous Earth,” and started marketing their products, which they now sell in a small tienda out on the road at the entrance to the property, and also at regional and national organic fairs. Along with Vía Orgánica, a popular and successful organic food store in SMA, they started the wildly-successful Saturday organic tianguis (market) in SMA, and makes sure that it stays organic. 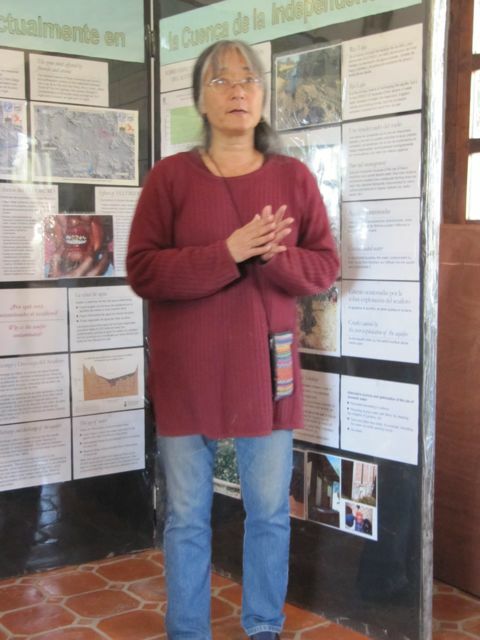 This is Holly Yasui, a Japanese-American, who came to CEDESA many decades ago as a volunteer and was so impressed with the place that she stayed on to work full-time. She was our translator and a very knowledgeable person with a warm personality. We went first to see an oven that uses minimal fuel. The old way was to go out and cut down trees for fuel. The new one is to prune the trees and use the cuttings for fuel. This is a stove that uses minimal fuel. 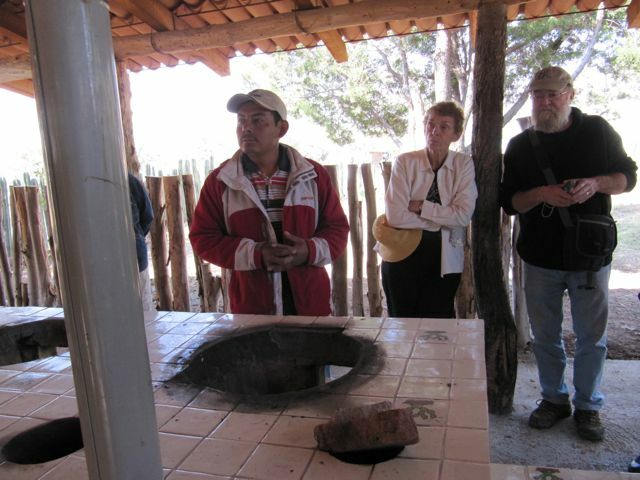 A flat piece of metal is put over the large circular hole to make tortillas and pots can be put into the smaller holes to heat up food. 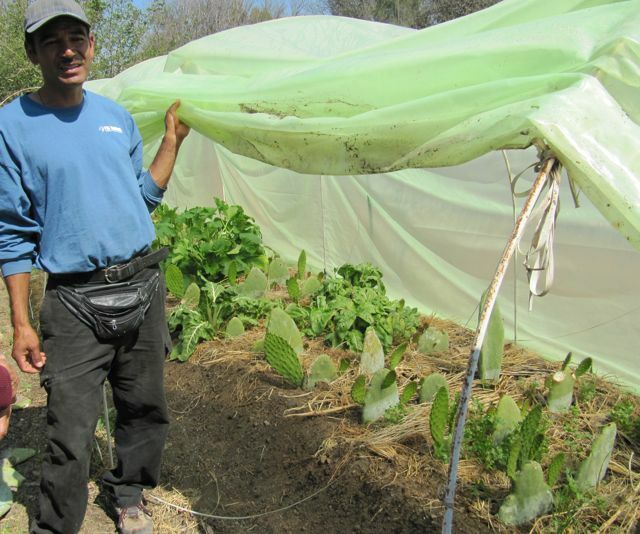 This man, who works at CEDESA, was a campesino himself, now has a degree and has taught backyard production and ecological techniques for the past 10 years. You see that thin white plastic on top of the turquoise toilet? 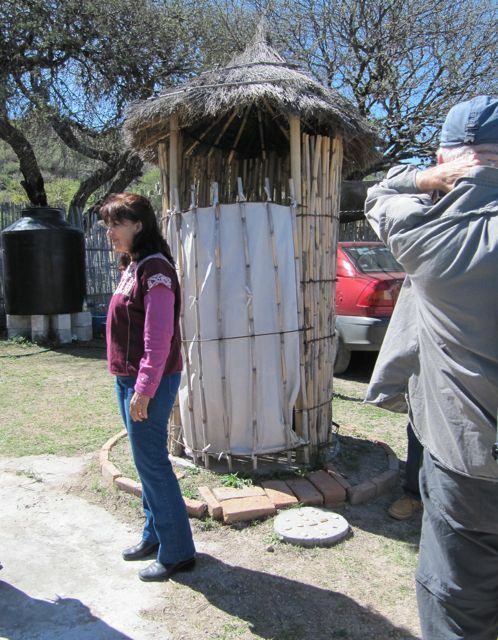 It actually has two chambers, because it is important to keep the urine separated from the solid waste. If they mix, bad odors form. Also, cleanliness of the entire toilet area is stressed. One uses the toilet with the white plastic thing in one direction for urination, so that the urine goes into one chamber for processing, and then turns it around for defecation so that material goes into another chamber. 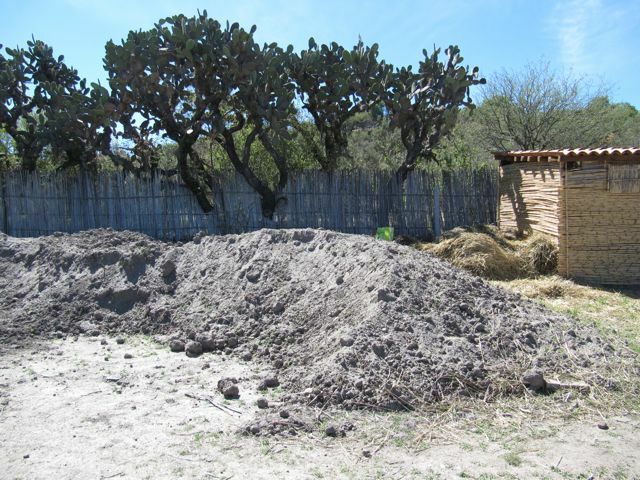 After each use, lime is scooped from a barrel in the room on top of the solid waste. This also prevents bad odors. 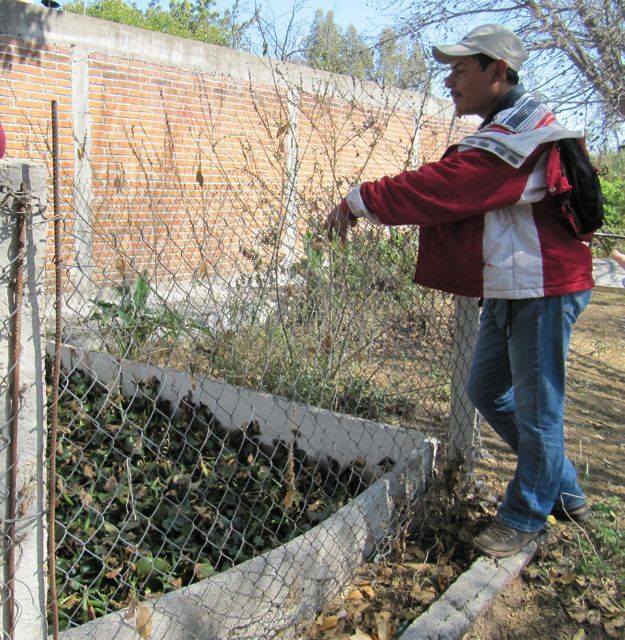 Eventually, the solid waste breaks down and can be used as perfectly-safe fertilizer. The man in the earlier photo teaches heads of households how to use the dry toilet, and then it is their duty to teach their families. This is a cistern for rain water catchment from roof tops. We were told that an average household’s roof could collect enough rainwater in a year to fill this container (if it rains, of course). 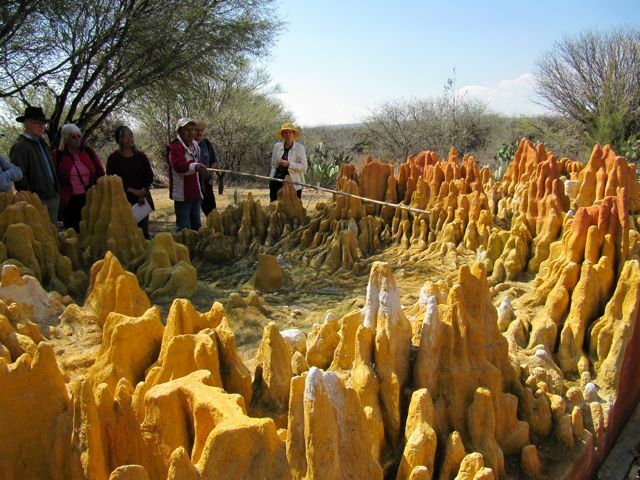 Over the last year and a half, with the help of a team of researchers from UNAM (the finest university in Mexico), CEDESA has constructed this huge model of the Independencia Aquifer which lies under most of the state of Guanajuato. It has been losing several meters of water each year for the past 10, and is not being refilled by current rainfall. 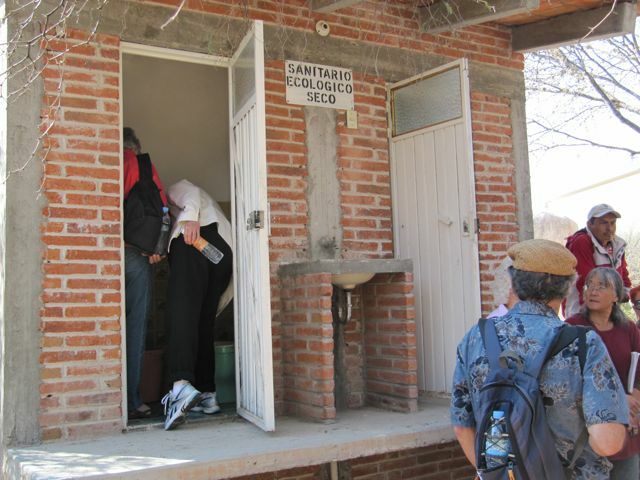 Also, tests have shown that in pockets of this aquifer, the water contains arsenic and fluoride. These heavy metals are not expelled, dissolved or made to disappear by traditional purification techniques such as filters. 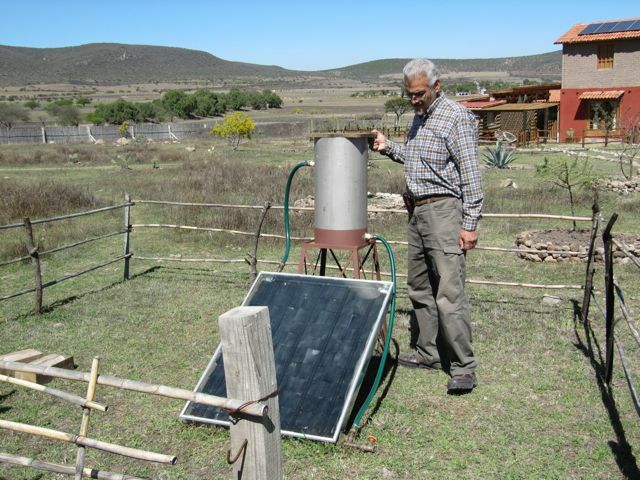 CEDESA and the UNAM researchers have designed a solar water distiller. 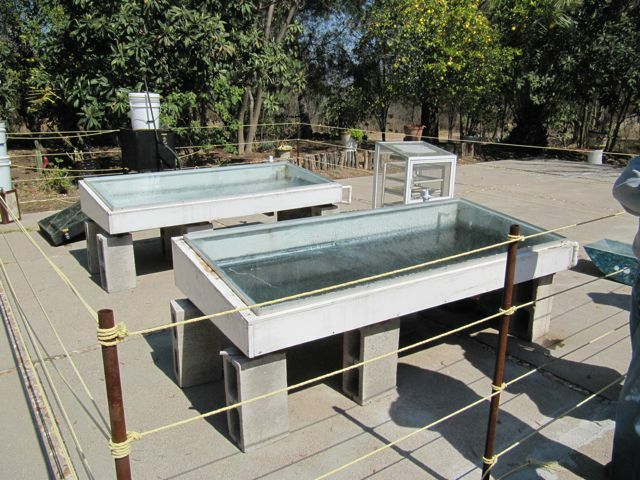 Once the simple wood and glass structure is built, the sun does the work of evaporating the water which is recaptured as it condenses and can then be used for drinking. This simple thing is a way to recycle grey water. Inside the low, white wooden walls are water hyacinths with their roots in grey water, busily filtering out contaminants. 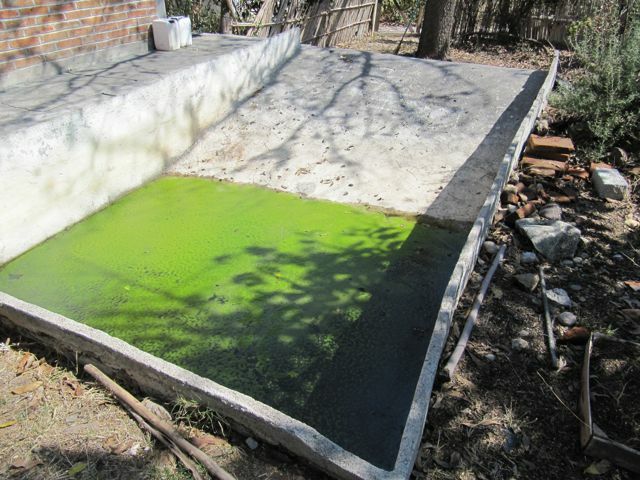 It then flows into a short cement trough off to the right where still other plants grow to filter out other impurities. It ends up here. No, it doesn’t look great covered with algae, and this is definitely not for human consumption, but it can be used safely for watering in the garden nearby. And speaking of the garden, this cheerful man, Pancho, proudly showed off his work place, which is kiddingly called, “Pancho’s Paradise.” The tool he’s holding, which we were told by one of us visitors is made in Canada by a company he used to work for, creates the little soil containers in which to propagate seeds, turning out six at a time with a little indentation on top of each for the seed. 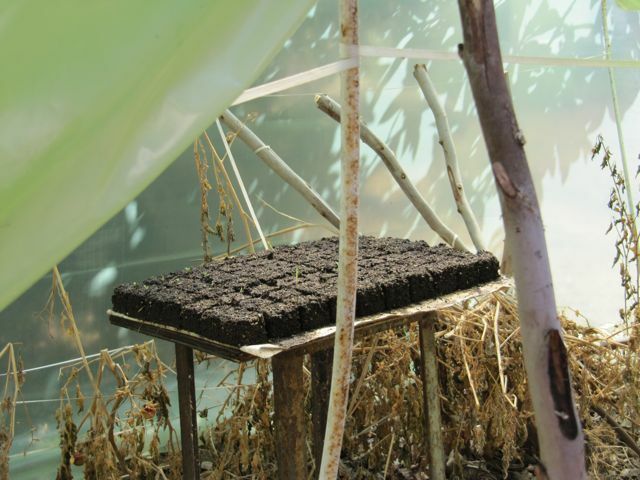 They are then placed in a hothouse (created with bent-over plastic rods with a plastic sheet secured on top) to sprout. As we walked to the next part of the garden, we noticed this man picking lettuce for our lunch. Now that’s fresh! 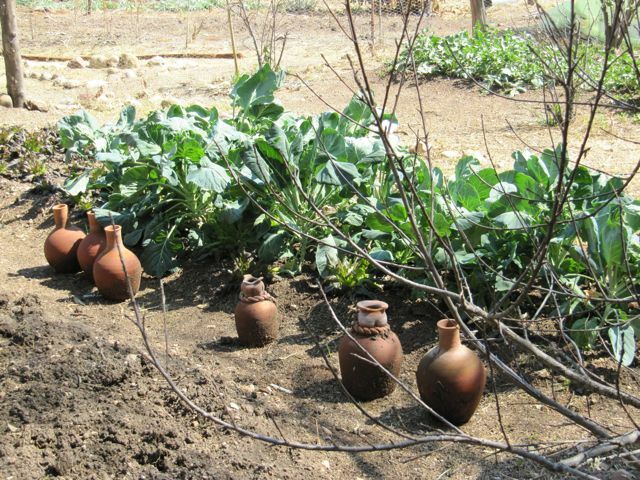 Here we were shown the use of unglazed pots for drip irrigation. 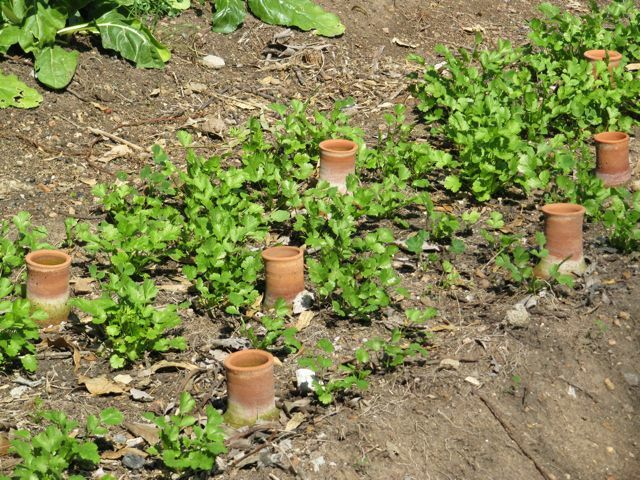 The pots are sitting next to a plot of land that will soon be planted. They are put into the ground up to their necks and filled with water as needed that then slowly oozes out through the clay into the soil. 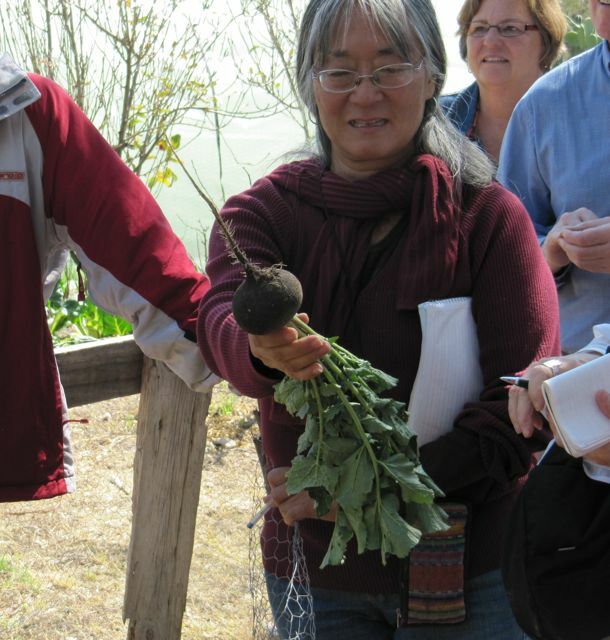 Holly picked a radish to show us the success of this method of watering. It’s huge! 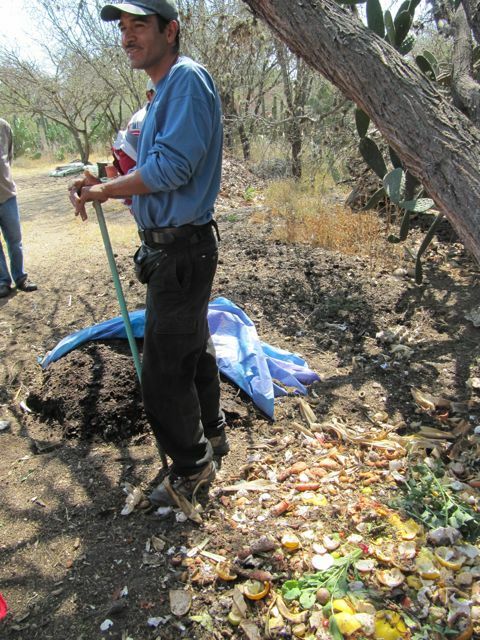 Here is Pancho standing between a small pile of garbage which will be used for compost and his latest completed compost pile (under the blue plastic). The entire garden is fenced in with chicken wire, which we were told keeps out most critters. 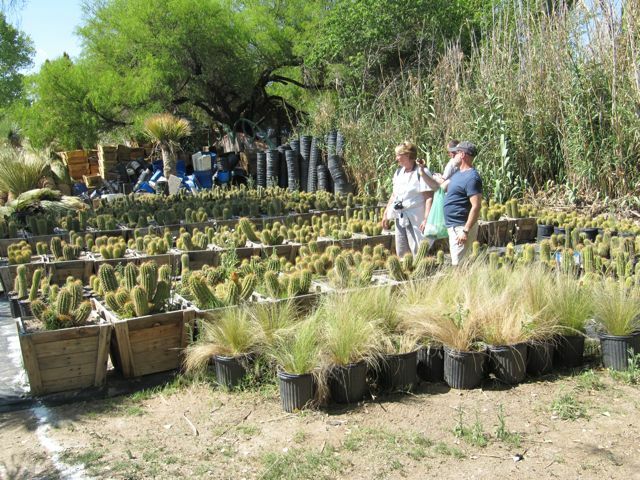 He then showed us the cactus propagation area. When he lifted the plastic cover, the heat and humidity that escaped were astonishing. 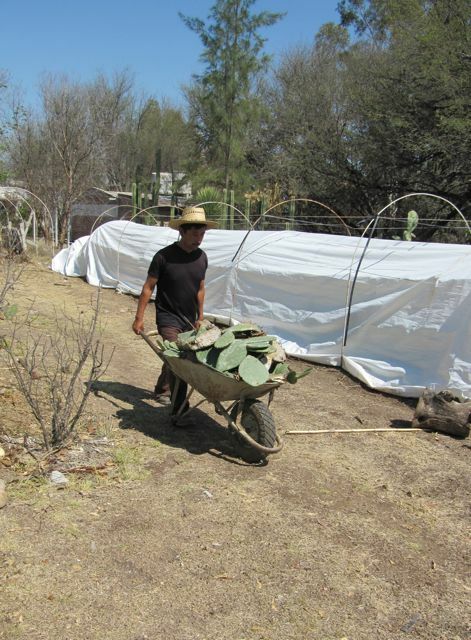 He simply puts a pad of cactus into the soil in the hothouse and new young, bright green cactus pads are produced from the mother plant. He told us that you must leave three of these new pads on the mother plant at all times, but then you can harvest all of the rest. 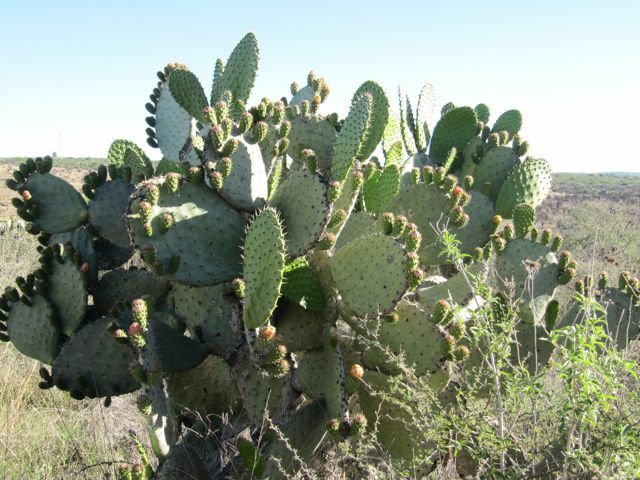 Mexicans are crazy for these nopales. 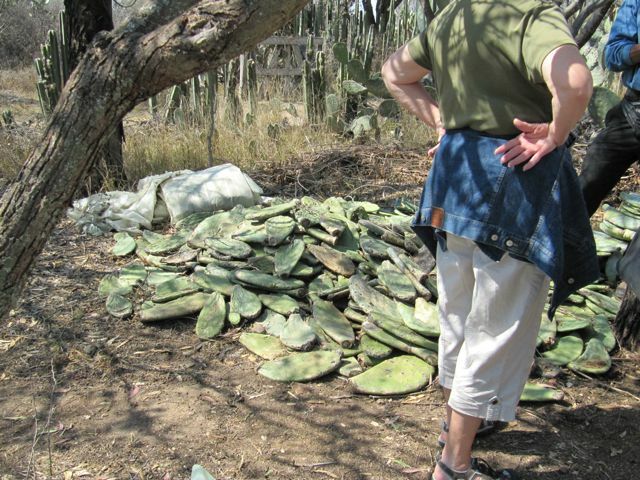 You see nopales vendors all over the place, patiently scraping off the inedible spines. We thought these were destined for the compost pile, but in fact are waiting to be planted in a hothouse. 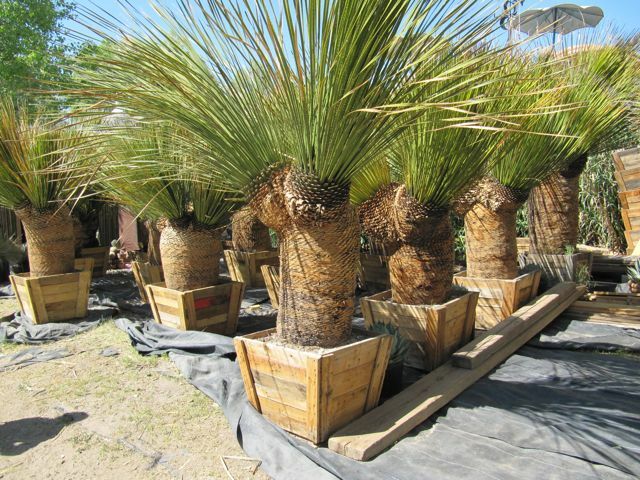 And here is a worker taking some of them to be planted. 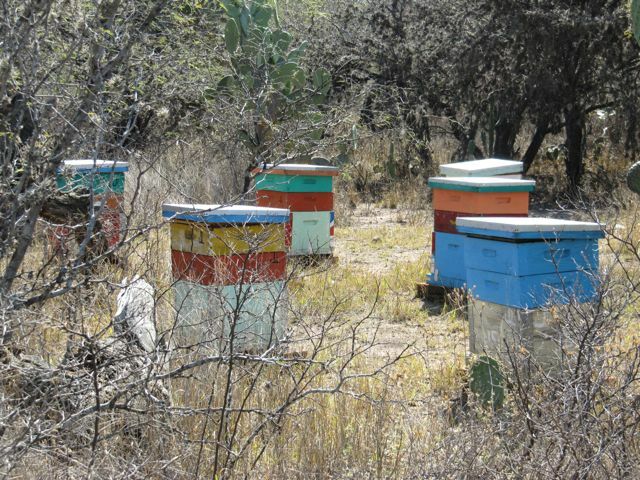 The next-to-last thing we were shown was the apiary, with the hives decorated Mexican style in bright colors. We were cautioned not to get too close. By this time in the tour, the sun was very high and hot overhead, I had not eaten in five hours, I’d been standing for about three, and I began to feel a bit woozy. I found a semi-shady place under a tree and drank a lot of my water. This was the last area we were shown and by now, we were all pretty done-in. This is a simple water heater, using only the sun. I sat far away in deep shade and listened to my stomach growling. A lot of other folks seemed to be in the same condition. Finally, at 1:30 (we’d arrived at 10), we sat down to a delicious meal of salad, spaghetti, chicken, corn tortillas, a very hot salsa, and an unusual dessert that was a little cube of a fruit substance like extremely firm jam. It wasn’t my favorite part of the meal, but I’d had plenty to eat at that point. On our way out, we visited the store for the community’s products. We were all disappointed that there was no honey for sale with their label on it, and we were told that it wasn’t the right season. I bought a lovely hand and face cream made from goat’s milk that was incredibly cheap and absorbed right in. It had been a good day, I made some new friends, and I learned a lot! Full disclosure – I took some of this information from the Center for Global Justice’s article in Atención advertising the trip. This was overheard by a friend when a little Mexican boy asked his mother that extremely perceptive question. 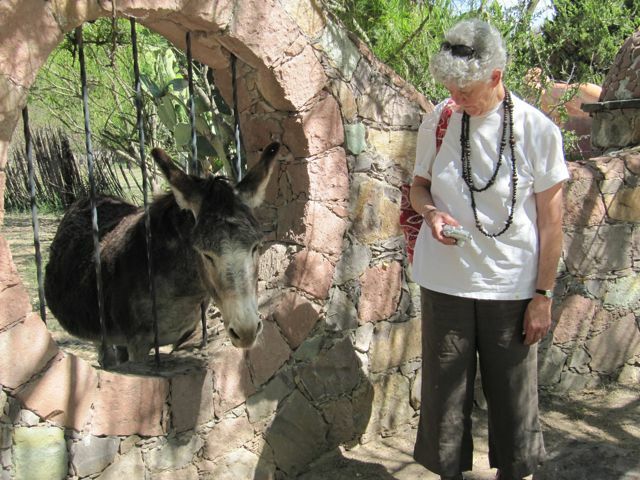 Yes, there are the occasional younger men, women of child-bearing age, and the even less prevalent kid, but overwhelmingly, the gringos in SMA are retirees. The first almost three weeks of February stood out for their really putrid weather here: grey, grey, grey, cold, cloudy, with frequent rain, often in the form of thunder and lightning storms, and the occasional really big downpour. This is extremely unusual weather for SMA in the winter. Many came unprepared. However, I have now put away my heavy pants, heavy socks, heavy shoes, heavy scarf, and gloves, with a pretty good guarantee that it’s all uphill from here on. I no longer need my electric blanket or my two scary gas heaters, and yesterday, I even needed the overhead fan while I worked at the computer. People were getting pretty grumpy with that bad weather, but we just kept keeping on. One cannot begrudge the area the rain, as they’re in the worst drought in 70 years, but it was hard to stay positive. Life is designed to be lived primarily outdoors here, since the weather is usually so favorable (a raindate for an event is unheard of, for example), so when one is forced to stay indoors for a protracted time, things get a bit tense. I had a feeling that when the Writers’ Conference began, and we were indoors for about 10 hours a day, the weather would return to its usually spectacular self. And I was right. A couple of weeks ago, I had some friends (gringos and Mexicans) over for wine, heavy hors d’ouevres, and then dessert, this in lieu of a full-scale dinner party, which I don’t do here. I decided to serve cupcakes as one of the desserts, made by a new company in town called, fittingly enough, San Miguel Cupcakes. They have about 10 varieties with two different kinds of icing (buttercream or cream cheese), and with a minimum order of just six of the same type, they deliver! They do not have a store. So online I ordered six each of carrot and red velvet with cream cheese frosting. I gave them a window for delivery on the day of the party. They called me by cell phone and told me to come down to the street as they were five minutes away and there is absolutely no parking available on my street (just like at home!). They pulled up, handed me the boxes, took my money, and were on their way, but not quite fast enough for the line of traffic that had formed behind them; horns were honking. What a cool way to run a business. P.S. The cupcakes were delicious and a huge hit. SM Cupcakes had provided them gratis to the last Mujeres en Cambio luncheon and gave out cards to all in attendance. I made sure to tell them that that’s where I first encountered them. Speaking of parking, this scene is just to the left of the door to my condo complex. It’s a special parking spot just for motorcycles. 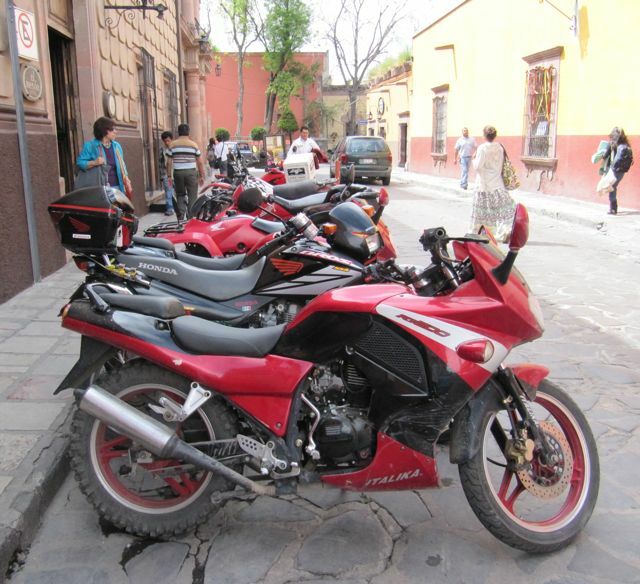 The day I shot this, all of the bikes were red. Most were Italika, which is, surprisingly, given the name, a Mexican brand. A few Hondas were there, too. The E with a line through it is, of course, No Parking, that is, No Estacionamiento. What a mouthful! 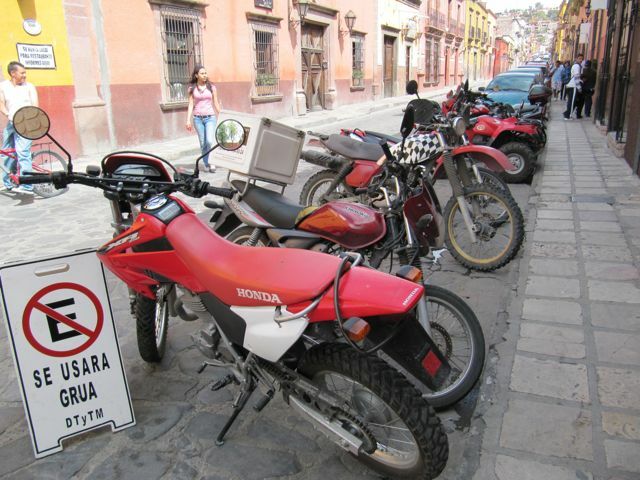 And the rest of the sign says that if you’re not a motorcycle and you park there, you will be towed away. I have never seen a tow truck in SMA, although they surely must exist. There is a very exciting political development in Mexico. Elections for president of the country, governor of the state of Guanajuato, and mayor of San Miguel will be held this July 1. Terms run for six years and there is no possibility of immediate re-election. For the first time ever, the PAN party (National Action Party) is putting up a woman for the presidency, Josephina Vazquez Mota. While there have been four earlier female candidates for the presidency, Sra. Mota is the first from a major political party with a real chance of winning. She is 51 years-old with three grown daughters. PAN is the party of the current president, Felipe Calderón. Sra. Mota says that, following in Calderón’s footsteps, she will not forge a truce with organized crime. PAN is the conservative party, but she has moderate views on core issues. 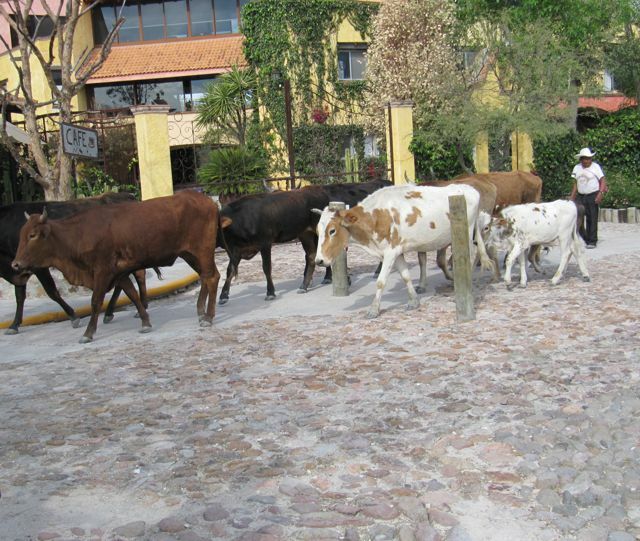 The first job of the morning for all household or business employees in San Miguel is to scrub with water, soap and frequently bleach the sidewalk in front of the home or store. (I often worry about the pigeons who come to sip the water which remains in the indented spaces in the cobblestones for a short while before it evaporates.) I live about one-third of a block from the famous Angela Peralta theater, which is on a corner. As I rounded the corner before 8 a.m. on my way to the Hotel Real de Minas for the first day of the Writers’ Conference, a stream of water flew out in front of me. Had I been a fraction of a second earlier, I would have been soaked. The completely embarrassed older man holding an empty bucket and I exchanged broad smiles and giggles. We realized at the same moment what a close call we had both had. On my second early morning jaunt to the hotel, I stopped into the Guadalajara Pharmacy to pick up some Broncolin throat lozenges to help with the head cold I had developed (more on this later). For some unknown reason, the clerk asked if I wanted them in the form of piruletas. I didn’t know the word, but it did start with a “p,” just as pastillas (lozenges) did, so I said yes. When she brought them out, the throat soothing medication was in the form of animal-shaped lollipops, presumably for kids. Wouldn’t I have looked cute sitting in the Writers’ Conference sucking on a lollipop! When I figured out what they were, I really had to laugh, and the clerk joined in. I finally did get the medication I was after. The 7th annual San Miguel Writers’ Conference, Feb. 16-19, 2012, is really on the map. The theme was “Creative Crossroads of the Americas,” and we certainly had A-listers from Canada, the U.S., and Mexico to deliver the keynote addresses: Margaret Atwood, who needs no introduction; Elena Poniatowska, of whom I’d not heard before, but who is one of Mexico’s most celebrated, prolific, and beloved writers; and Native American Joy Harjo of the Muscogee Creek Nation, poet and musician. Naomi Wolf, activist and writer, spoke on “Writing Riskily: Taking a Stand With Your Prose” as a general session speaker, and later on “Protest 101” after a viewing of the documentary made from her book, “The End of America.” (Be afraid. Be very afraid.) Because there is simultaneous translation into Spanish of all the major events at the conference, it bills itself as “the only bilingual and bicultural conference of its kind anywhere in North America.” In addition to the keynotes, there were daily general session speakers, two time periods each day dedicated to concurrent workshops for both English and Spanish-speaking writers taught by world-class faculty, author readings, open mic sessions, pitch sessions with literary agents, individual consultations with seasoned experts, book signing receptions, a “Viva México” reception of enormous proportions, a theater presentation on Dorothy Parker, and a closing party. 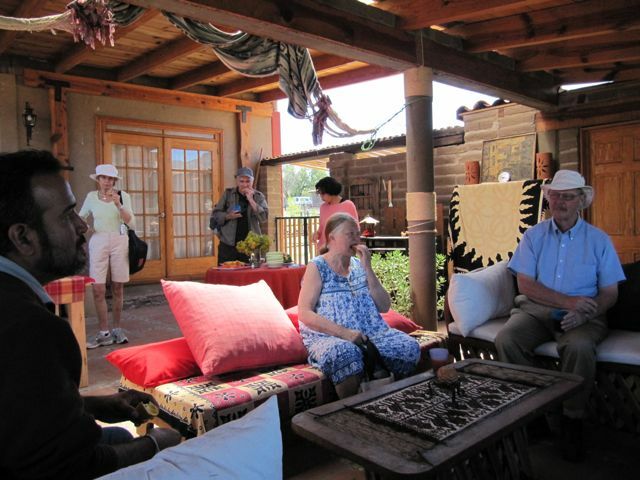 If anyone had an ounce of stamina left after the four days, and there were those who did — I not among them — there were several two-day intensive writing courses to choose from, and excursions in and around San Miguel. I had hoped that my attendance at last year’s conference would goose me to get going again on my memoirs. I had a truly fantastic time, met many new friends with whom I am still very much in touch, but I did not get the boost I had hoped for. This year I did. The big thing that had been hanging me up was that I didn’t know how to structure my memoir. I had written many individual stories and I had planned to continue on in that way, hoping that a structure would present itself. I came up with a structure that I am thrilled about as the result of a discussion at breakfast with another conference participant that had absolutely nothing to do with structuring a memoir. And, as the result of one of the workshops I took, I changed the working title, taking the emphasis away from my parents and putting it where it belongs: on me and my life. I now believe that things had been incubating all of that time and could not be rushed. I am busily filling in the outline as things occur to me, and when I’m back in Philly, and the long, hot and humid summer days loom when the Finns return home after their visit, I will get to work. The Canadian Embassy in Mexico was so thrilled that homegirl Margaret Atwood was coming to the conference that they covered all of her expenses and sent a car to the Mexico City airport to pick her up and deliver her to SMA. 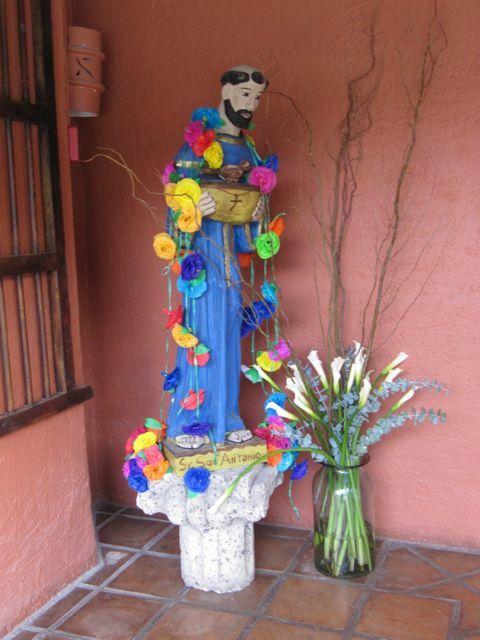 This charming, colorful St. Anthony greeted us as we filed into the main hall for the keynotes. Eight hundred people had bought tickets to hear Margaret Atwood on the first night. When we were all seated, and her presentation was about to begin, the doors to the outside were closed and no air was circulated in the room. It was not hot at all, but there was no air. Toward the end of her talk, finally some air-conditioning was turned on, but too late for me. I awoke the next morning with a cold. I had a most unusual encounter with Elena Poniatowska. Most of our half-hour breaks were spent standing in line to use the restrooms and then scampering on to the next workshop to get a good seat. In the women’s room the first day I noticed an attractive older woman in a Mexican outfit in a gorgeous shade of purple. She was not wearing a name badge, as almost all of us were. She was having difficulty trying to get the water to come out of the faucet. I demonstrated how to wave a hand in front of the electric eye, causing the water to flow. Then there was the soap dispenser that required more hand waving, and finally the no-touch paper towel dispenser. I helped her with all the gadgets and she said how she’s not good with these modern conveniences. 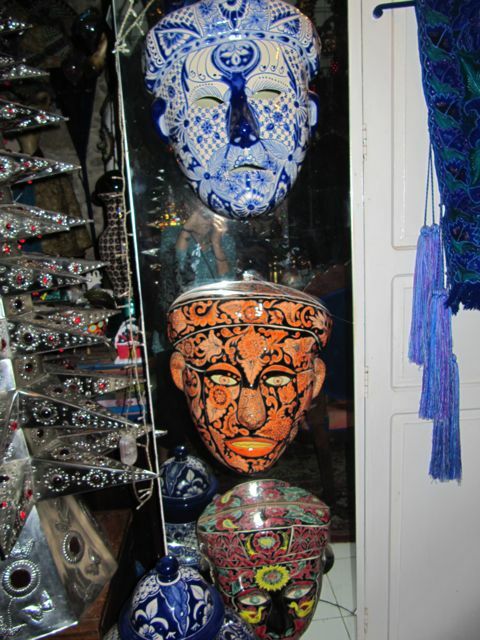 I concurred, saying that all of them are different and it was difficult to tell sometimes where to put your hands. She thanked me and we went our separate ways. What a shock when later the same woman stood at the microphone to deliver a keynote address and it was Elena Poniatowska! I also had an amusing encounter with Naomi Wolf at the fiesta. I greeted a friend of mine who was standing with a woman I did not know. She introduced herself to me as “Naomi.” Luckily, my brain cells were still working and I said, “As in Wolf?” Yes, indeed, there I was chatting with Naomi Wolf. Well, perhaps chatting is not the correct word. I was star-struck. Happily, someone else came along at just that moment and starting really talking to Naomi. 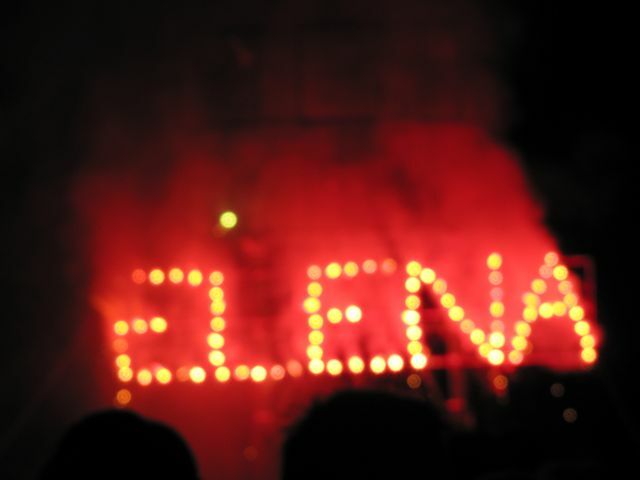 Later at the fiesta, there were fireworks which spelled out the three keynoters’ names: Mgt (spelled just like that), Joy, and Elena. 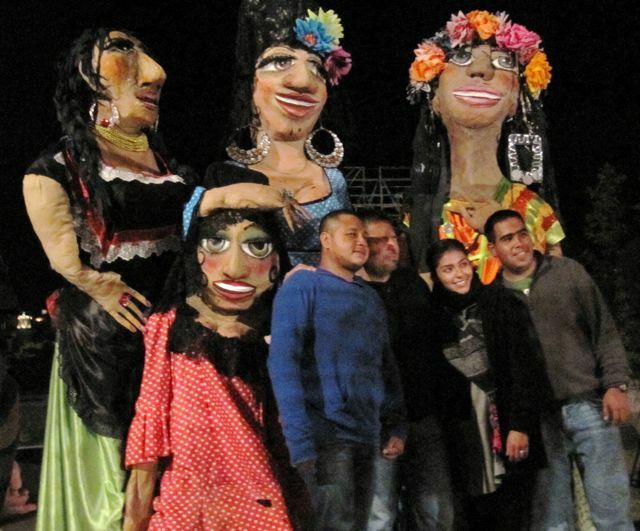 Following that, there were Mexican dancers who performed and then took partners from the audience. 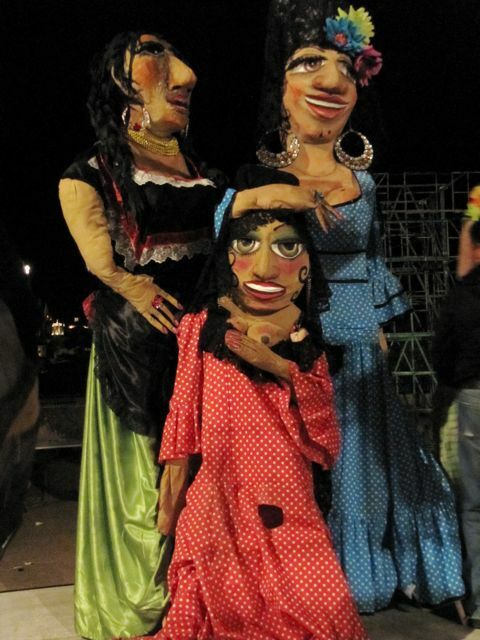 And of course no fiesta in San Miguel is ever complete until the mojigangas make an appearance, wardrobe malfunction and all! I liked this photo because it showed the smiling face of the man beneath the skirts of one of the mojigangas. I had stopped reading Steve Job’s biography to read Margaret Atwood’s “The Year of the Flood” in preparation for her keynote address, but she barely mentioned it. I’m glad I read it, though. Humorous and dark, all at the same time. She was extremely witty in her keynote. She has a sort of deadpan presentation, but with impeccable comic timing. I took a workshop from Graeme Gibson, Margaret Atwood’s husband and also a writer who, among other deeds, founded the Writers’ Union of Canada and the Writers’ Trust. His class was entitled “Non-Fiction: Wrestling with the Gift.” I didn’t even realize that he was her spouse until he said something about “Margaret and I hike frequently.” He ended his presentation with an incredible story, which I must relate. 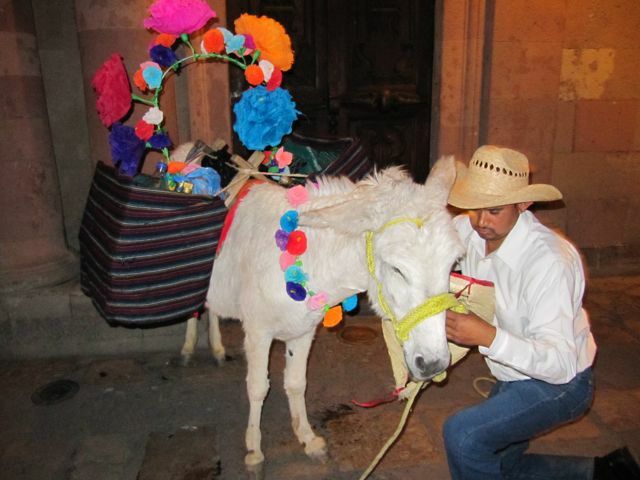 He was in Mexico many years ago and two boys approached him with an African green parrot in a burlap sack. The parrot was for sale. As he had always wanted a parrot, he bought it. Somehow he took it home to the U.S., and it lived with him, a former spouse and their two sons for a year. The parrot learned to say quite a few words. One day, he decided that the parrot was not itself anymore and seemed depressed. He went to the local zoo to see if he could donate it and also to check out the facilities. They were wonderful; the birds could fly around freely and there were many other parrots of the same species. He took the parrot to the zoo and stayed around just a short time. As he was leaving, the parrot screamed, “Daddy! Daddy!” It had never used that word before, but it knew the word, it knew who Daddy was, and it knew in what context to use it. Well, there was not a dry eye in the room. Someone asked if he left the parrot or could not bear to part with it. He said he did leave the parrot because he knew that it would eventually be much happier at the zoo. He returned four to five months later and he could not tell his parrot from all of the others of its kind, and his parrot did not come over to him. He said that at the moment the parrot addressed him as “Daddy,” he decided to dedicate his life to conservation, particularly of birds. He is the joint honorary president, along with Margaret, of BirdLife International’s Rare Bird Club. He is also chairman of the Pelee Island Bird Observatory, and has been a council member of World Wildlife Fund Canada. He is a member of the Order of Canada and an Honorary Fellow of the Royal Canadian Geographical Society. 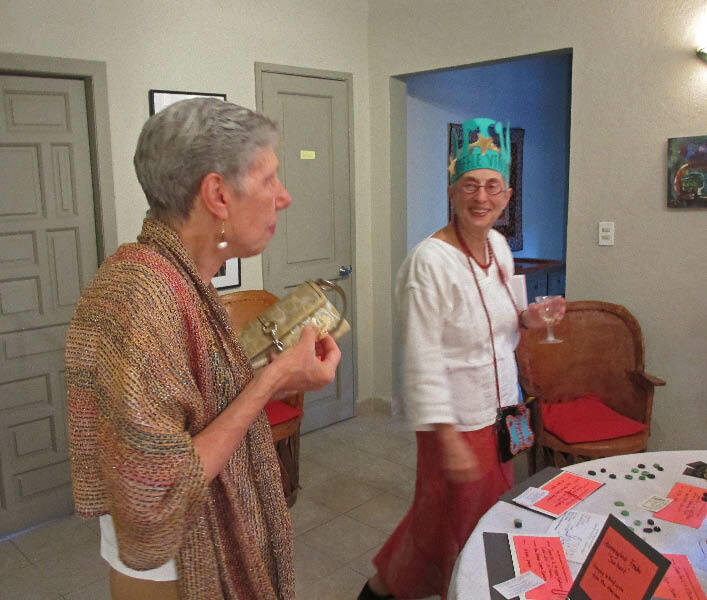 My favorite workshop of all was given by Béa Aaronson, a Parisian with incredible energy and gifts, called “Béa’s Beyond Boundaries Weird & Wonderful Writing Workshop.” It was listed as “a Dada experience of freedom! Within the creative act of writing, NO RULE is the rule. Mixing genres, mixing sources. Writing by hand. Collaging cut out words. Inventing words. Playing with SOUNDS. Destroying syntax. It will liberate your mind! Allow your mind to venture in creative avenues of thinking and questioning you would not have dared otherwise. 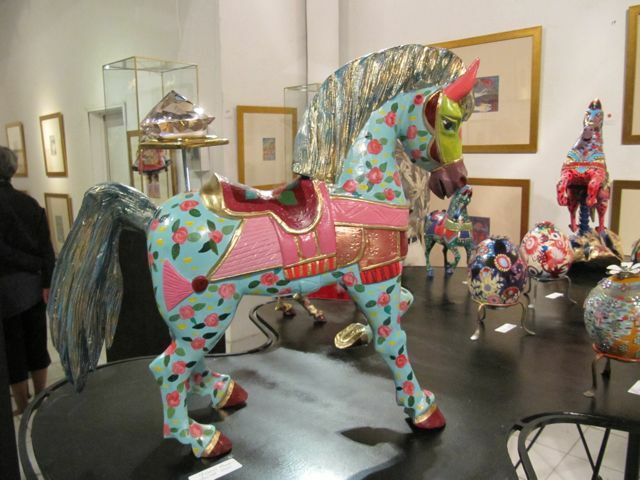 Feel the power of imagination, the bubbling tingles of childhood playful inventions. 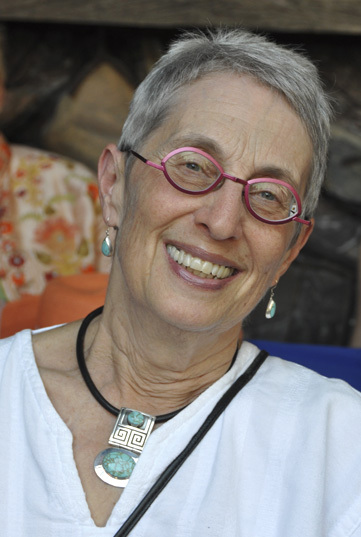 Maybe you will find a vocation to understand life’s serious matters — through subversive, anti-authoritarian, fun imagining.” Wow, it was really something, and she has promised to offer a full day workshop of this type at her home here in SMA sometime in March. I won’t be able to sign up fast enough. On a totally different topic, and a very sad one at that, a Mexican woman was killed by a bus at an incredibly complex corner that unofficially serves a a bus depot. I came upon the scene right after it happened. I was on my way to teach ESL to my former neighbor’s kids on Calle Animas and didn’t stop to see what all of the commotion was about. A friend said that a woman had been standing, talking to some friends in a car, and when the conversation was over, without looking, she just struck out to cross the street and a bus hit her. The driver said he never saw her. My friend said that after they determined that the woman was dead, they covered her body and about 200 people stood around in total silence until the ambulance arrived. As I’ve been perplexed and scared at that intersection for years, I was pleased to note today as I walked past on my way to a haircut appointment, that there are now yellow plastic markings on the street, ropes strung up, directional signs, etc. to help people better navigate the traffic there. If these things help to save lives, the woman did not die in vain. 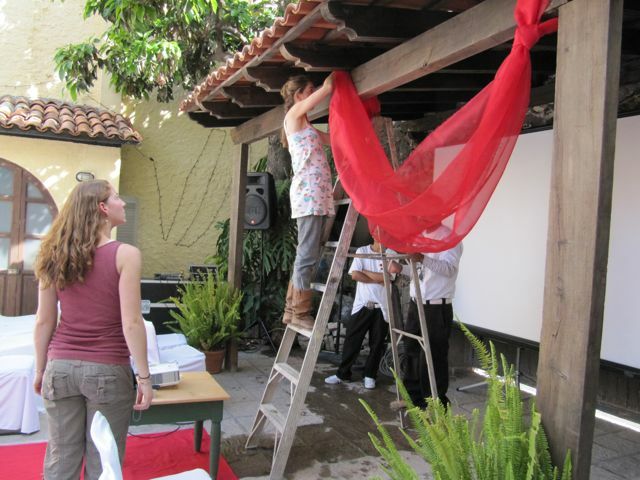 Preparations had begun weeks before the Ojalá Niños’ Red Carpet Oscars Night party on Sun., Feb. 26, of course. 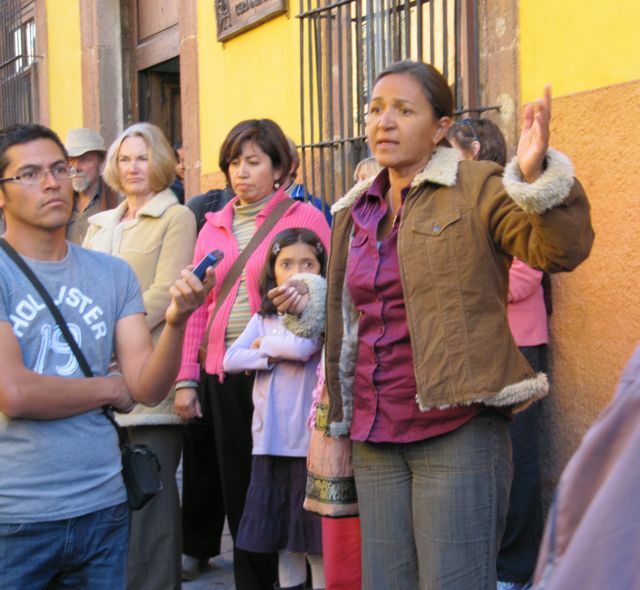 Elsmarie, the founder of the organization (in photo below, top left, in black), was uneasy, as the intended audience was strictly gringos, and she said in all the years she’d been fund-raising, she’d never had an event that wasn’t pitched to everyone. 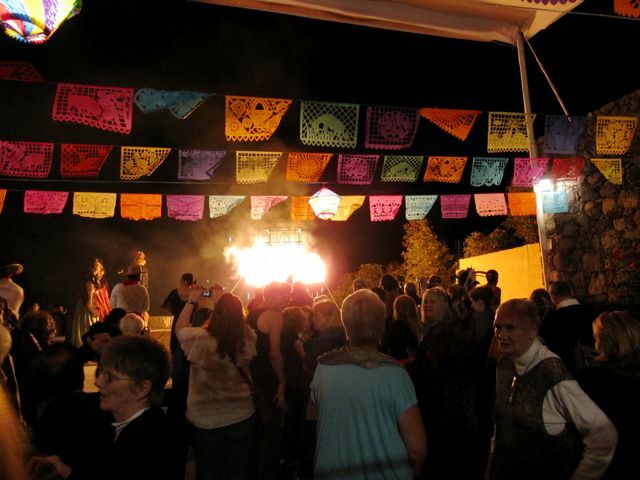 But clearly, as a major fund-raiser, it was slanted to the gringo community on a special night for them. 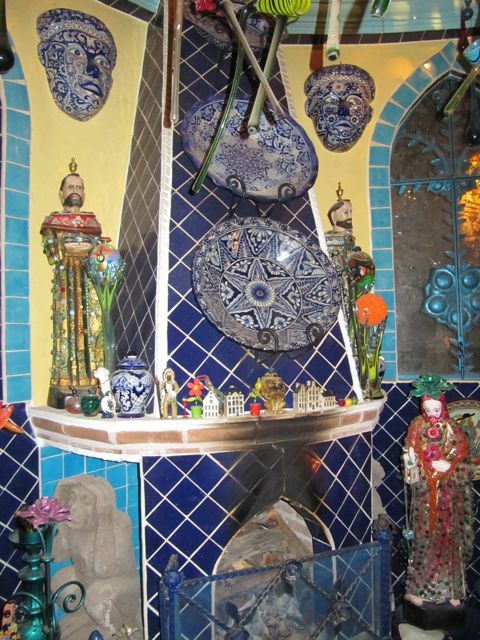 The fiesta was limited to 100 people, so it felt very exclusive (part of the appeal, we hoped), as that’s all that could fit into the terrace of Casa de la Noche (House of the Night), a former bordello just around the corner from my rental. I sold the most tickets of anyone: 20! I also hung up posters around town, solicited a few restaurants where I was a frequent customer for food donations for the event, and was pleased to be so well received. I have to say that the food contributions were amazing! We must have had food from 20 different restaurants in town, and in great abundance. I also showed up a couple of hours early to help decorate the place. You can see from the photos below that we really did have a red carpet! The woman at the bottom of the steps in blue is the owner of the bordello B&B. 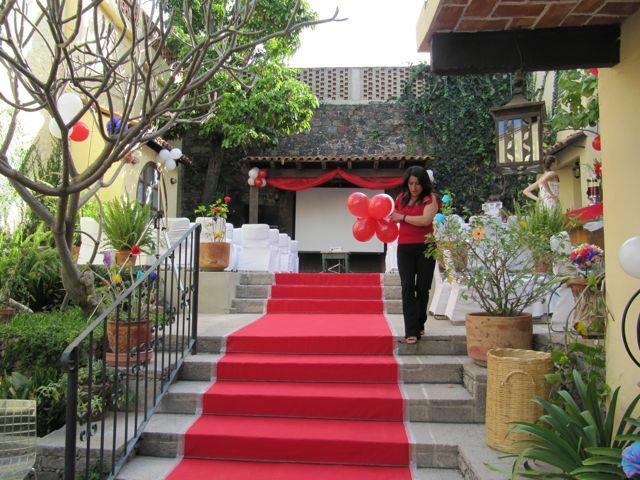 She frequently hosts weddings there, so her steps were all set up to accommodate the red carpet. There was a hem at the bottom end into which a metal pole was inserted, which then slid into place into the concrete of the steps. The metal poles on the upper steps went over the carpet and held it in place. It was quite ingenious. 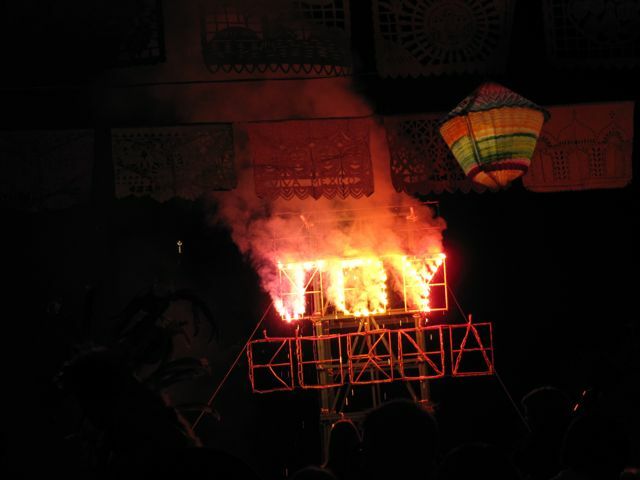 Several of the young volunteers blew up many balloons, but those which remained in the sun soon popped from the air inside heating up and expanding. 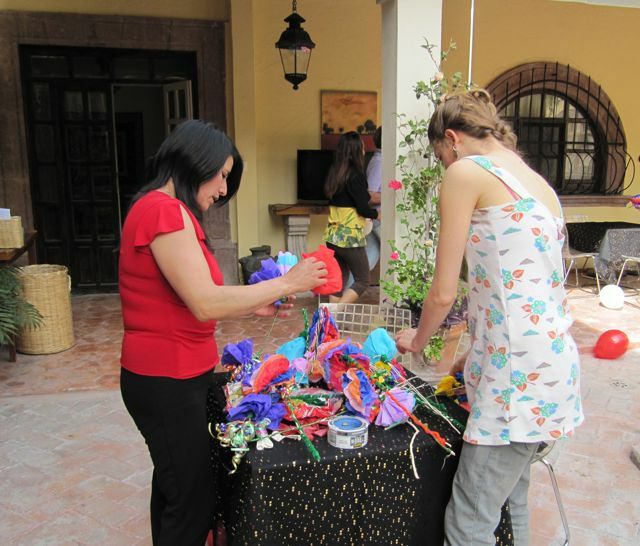 The Ojalá Niños’ kids had made lots of colorful paper flowers to help decorate. 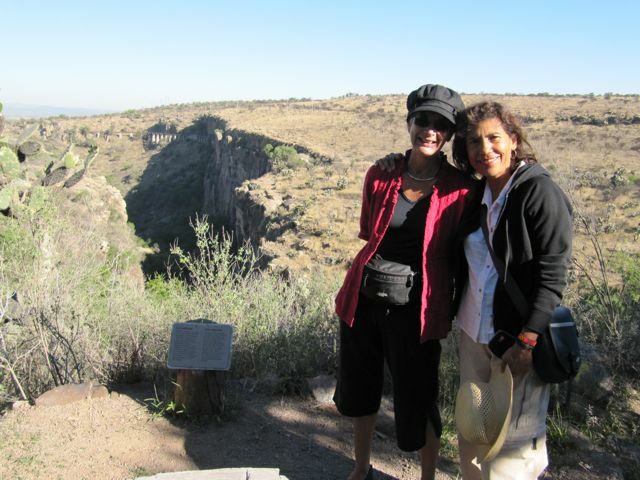 The Mexican woman on the left is a teacher in the program, and the gringa on the right, a volunteer intern. I wonder what the young Mexican men hired to help out thought about the gringas hanging the red material while they stood around. 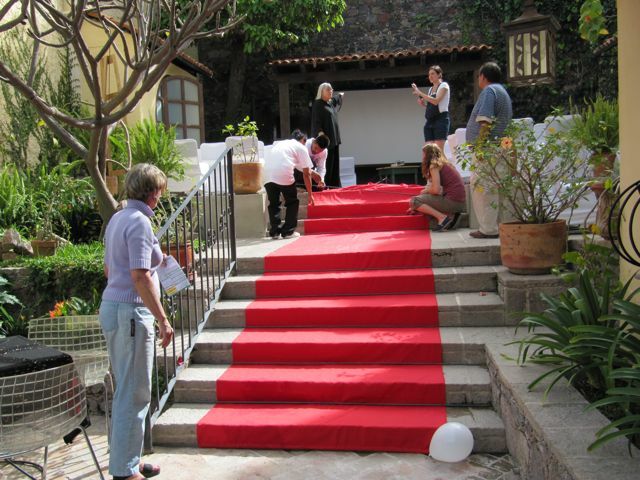 Tape was carefully applied to the edges of the red carpet to keep it flat and non-lethal. We all tried not to walk on it as we completed the decorations, but that was easier said than done. With the white-covered chairs and the large-scrren TV, I thought the place really looked amazing. There were three other viewing areas with not-quite-so-large TVs and groupings of tables for four. There was a bar set up with four bar-tenders. All hors d’oeuvres were butlered, which made it seem really classy and kept people from piling their plates with food they may not even have eaten. The place really looked smashing when all of the decorations were in place. And people really dressed up for the occasion. When the party began at 5:30 (that early because of the two-hour time difference between California and here), I became one of three raffle queens, complete with decorated foam crowns. 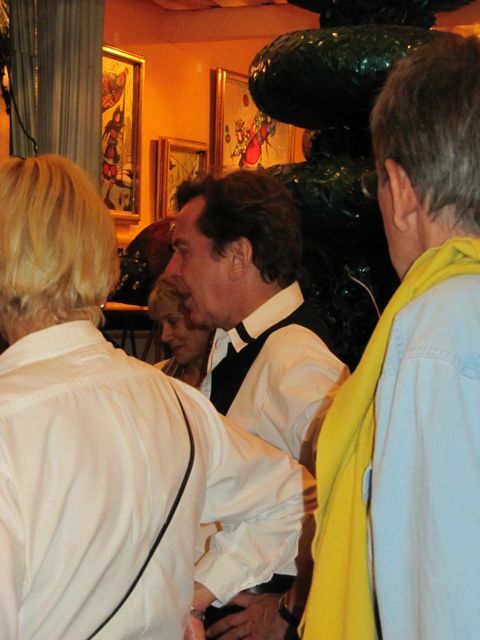 I’m sorry that I didn’t think to have someone take my picture, but I was kept very busy selling raffles. 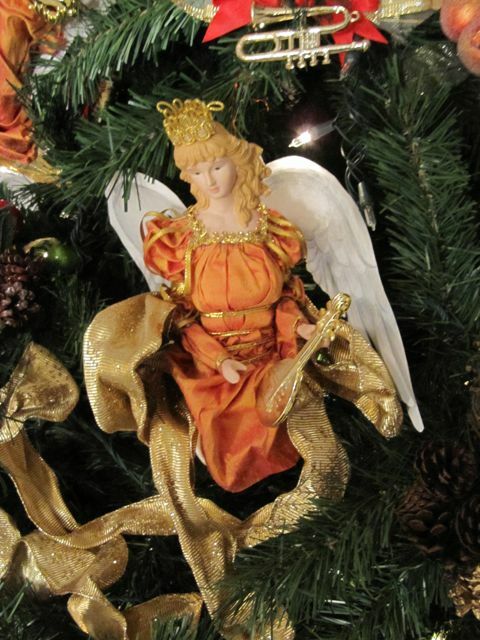 We had 35 excellent gifts donated by local shops and individuals. The raffle was done in a little different way than usual. You could buy your raffle tickets up to 8 p.m., then during a commercial break on the Academy Awards show, the first five numbers were pulled. Winner #1 got to choose among the gifts first, #2 second, and so on. At subsequent breaks, more numbers were pulled, until all the gifts were chosen. One guy who chose a magnificent foot-high, painted wooden tiger, walked around clutching it to his chest for the rest of the evening; he was that fond of it. I didn’t win anything, but one of the people I sold tickets to did, and was very pleased with her choice. We made 14,000 pesos (almost $1100) on the raffle alone! I was very proud. And exhausted, as I’d stood up for many, many hours in party shoes (not high heels, of course, but fairly new, fancy shoes) explaining how the raffle worked, selling the tickets, grabbing a few nibbles from the waiters as they walked by, and trying to catch a few glimpses of the televised awards. In the days afterwards, I wrote 10 thank you notes — in Spanish! — to some of the participating restaurants and hand-delived them to broad, appreciative smiles. The next day, I skipped yoga in order to catch the first shuttle to a community called Los Labradores, about 15-20 minutes outside of town. My friend Ellen, from Landenberg, PA, whom I met here in SMA last year, rents there. “There” is a still-growing community of “villas,” mostly 2 BR, 2 bath all-on-one floor houses, although there is the occasional one with a loft space for an office or additional sleeping room, clustered around “lakes” (really ponds, in my book). There are at least four swimming pools, fed by the near-by hot springs; a cafe, a gym, tennis courts, an all-purpose room for parties, lectures, etc., a library, and lots of other facilities. As one ages, whatever services are needed can be contracted for at the rate of $6.00 USD per hour. There is also a small (currently 10-bed, but expanding soon to 15) assisted living facility, of which we had a tour led by the Mexican doctor in charge. Price for a month in assisted living: $2500 USD. Compare this to the $6,000-$8,000 per month in the U.S. for a comparable facility. We also had a tour of three or four villa models that were available for sale. 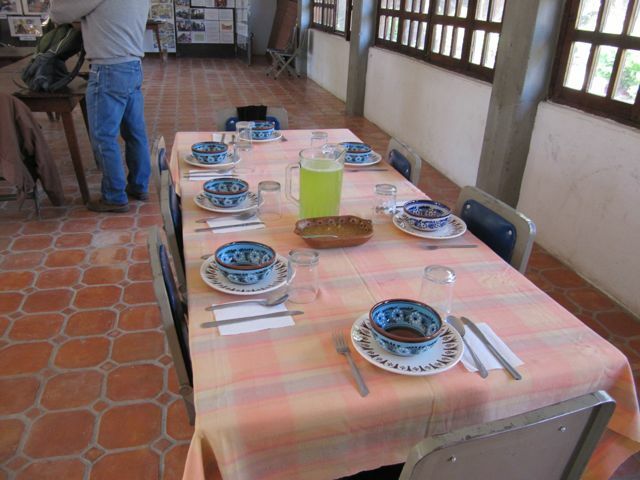 Ellen provided a delicious lunch and we even got to go in one of the pools. It’s interesting that Ellen has more or less duplicated her life at home in her choice of rental here (she has a house on water in PA), and I have done the same with mine (downtown Philadelphia and downtown San Miguel). As we sat at the end of the day awaiting the shuttle to return me to town, off in the distance we could see it, but preceding it was a small herd of cattle accompanied by their shepherd. It must be that the facility was built on land the cattle used to graze on, as Ellen told me that every day at that time, the cattle were moved right through the facility to their evening pasture. None deviated from the path, although I stayed vigilant. Quite the sight! And then that evening, I attended a Circle Cena (a Circle Dinner, basically a pot-luck for 6-10 people, several of which are held in different hosts’ homes at the same time on the same date), organized by my UU congregation. 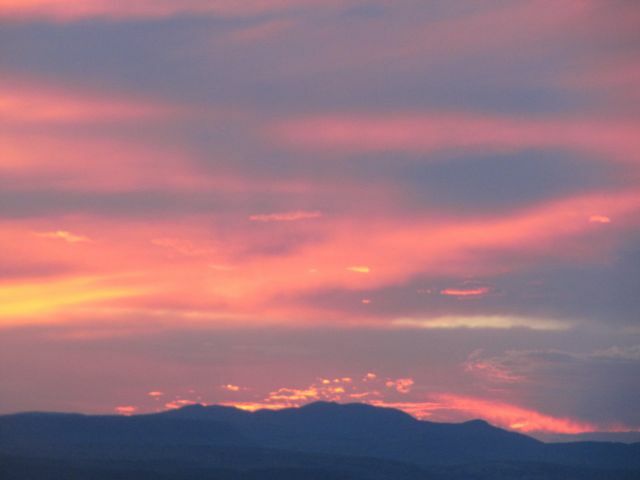 We sat on our hostess’ terrace with wine and cheese and watched the sun set, always an inspiring event. First, apropos of nothing Mexican, was this headline on my NY Times Internet homepage recently: “Egyptian Islamist Expelled in Nose Job Scandal — a law-maker who said he was beaten by gunmen, had in fact undergone plastic surgery, doctors said.” I find that completely hilarious. On Sat., 3/3, I accompanied seven other people in a van to a very special place about a half-hour outside of SMA, on a Center for Global Justice-led trip to the non-profit GAIA. 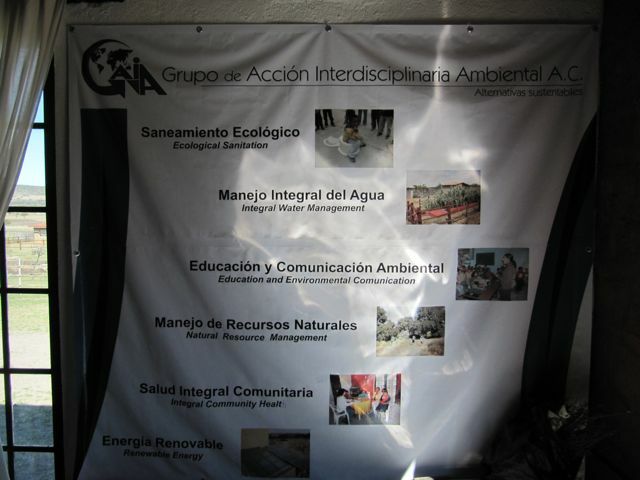 GAIA is an acronym for Grupo Acción Interdisciplinaria Ambiental (Alternativos Sustenables), an interdisciplinary action group for the environment using sustainable alternatives. The “group” turned out to be a lovely, extremely well-educated and forward-thinking Mexican family who five years ago, wanting to reduce their footprint on this earth, left their home in Cuernavaca, in the state of Morelos, and after an exhaustive search for land “near jungle and ocean,” as they said, purchased the land near SMA (near to neither! 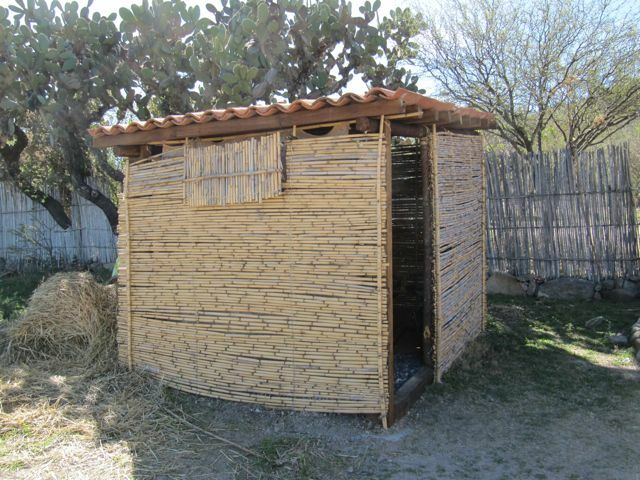 ), and began a gutsy experiment in sustainable living. 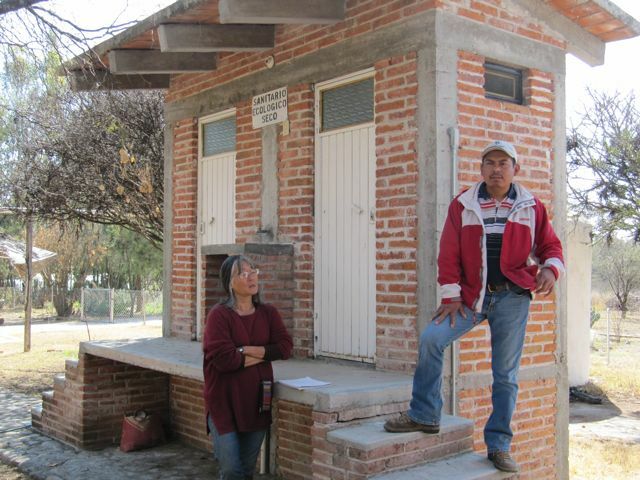 Each family member is an expert in a different area, such as ecological sanitation, integral water management, education and environmental communication, natural resource management, integral community health, and renewable energy. Whew! 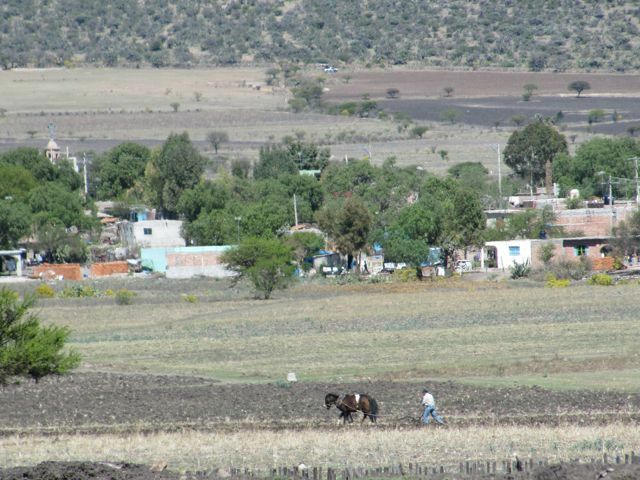 When the family bought the land, the locals had been using it for grazing their animals. It was rocky and eroded. The previous owner sold it to pay for his son’s wedding. The first thing they had to do was to restore the land. We started off with the grown son, Attahualpa (an ancient Inca name), nicknamed “Atta,” in his late 30s, as our guide. He told us he had studied biology in Mexico, and then went to the US and Canada because there was no career possible then in environmental science in Mexico. 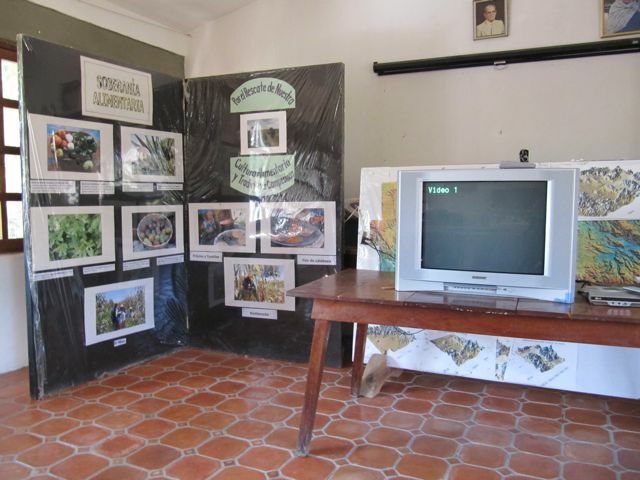 He also studied agronomy in Cuba during the oil crisis and learned to do many things without oil. Atta showed us some sustainable materials and methods of construction of eco-friendly dwellings (in somewhat miniaturized versions), the one in the photo below of a bamboo-like material. 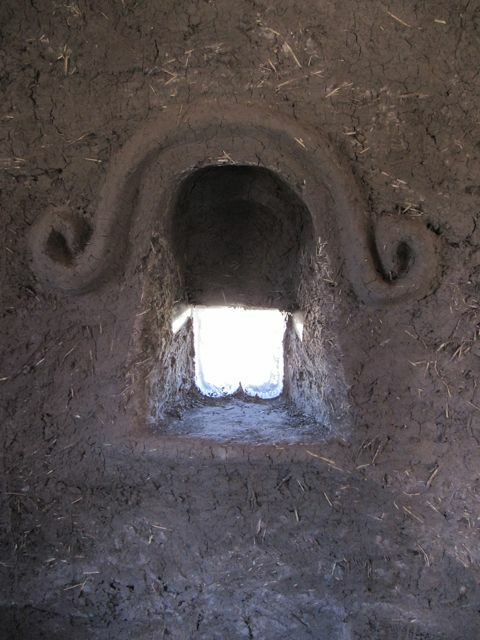 …and here is the nearly-finished product, using cob construction, an ancient technique from Africa and Asia, using only straw, soil, and water, which is mixed with the feet. The workmen had a ball, discovering that they were artists as well as skilled abode builders. They were given free range on making the building look appealing. 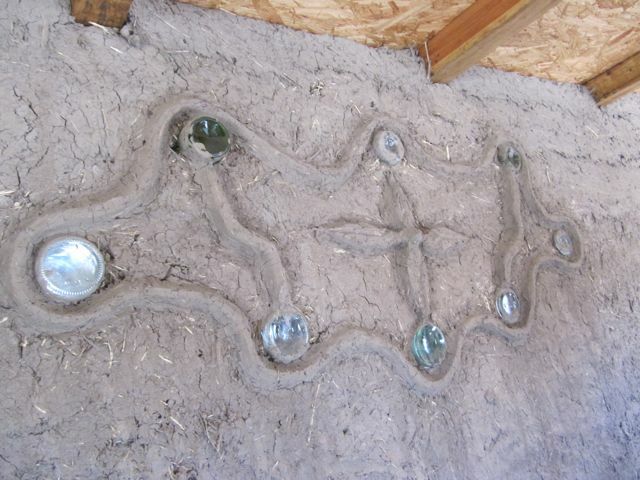 Real windows were installed, but more light than that was let in with the use of empty bottles. This building will get a finish coat when the material used is fully dried. Inside. Check out the thickness of the walls. Atta told us that the family is not yet raising all of its own food, although that is their goal as they work toward being self-sufficient. 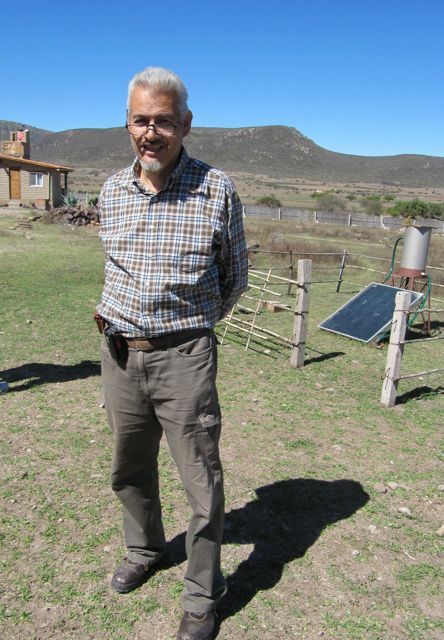 They are totally off the grid, however, as all of their energy needs are met by solar-generated electricity. They have received much help from other NGOs, friends and neighbors. This is Atta’s mother, whose name I’m embarrassed to report I forget. She is an extraordinary person. She is 65 years old, and look at her! She had the most amazing eyes I’ve ever seen. I believe that they are the eyes of someone totally at peace and filled with contentment. 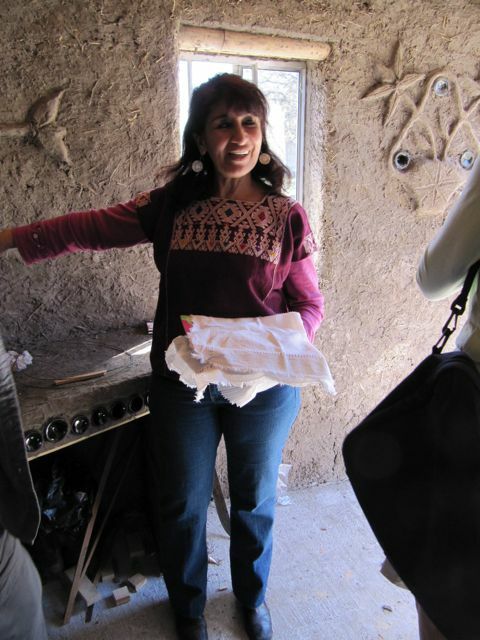 She is a curandera (traditional folk healer), a homeopathist (she showed us her closetful of remedies), and she teaches thanatology (the scientific study of death). 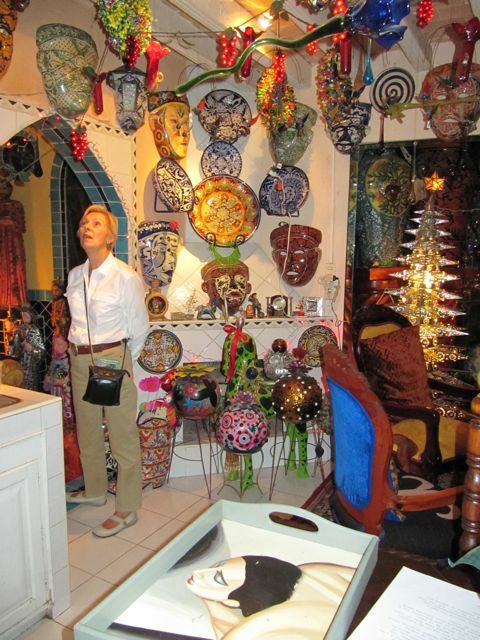 She still maintains a thriving business in Cuernavaca, as their home there was turned into a clinic. In addition, she is trained and licensed as a psychologist. When the family first moved into the community, they didn’t push themselves onto it in any way. They respected how things were done locally. Soon neighbors started coming out of curiosity. 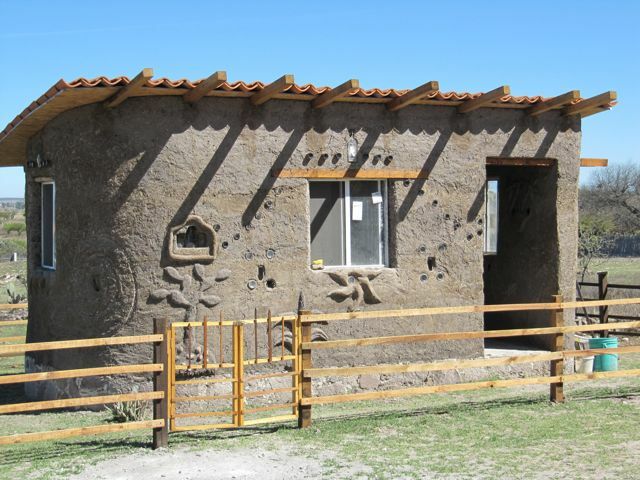 The newcomers learned that the locals never build with adobe, believing it to be the building material of the poor. 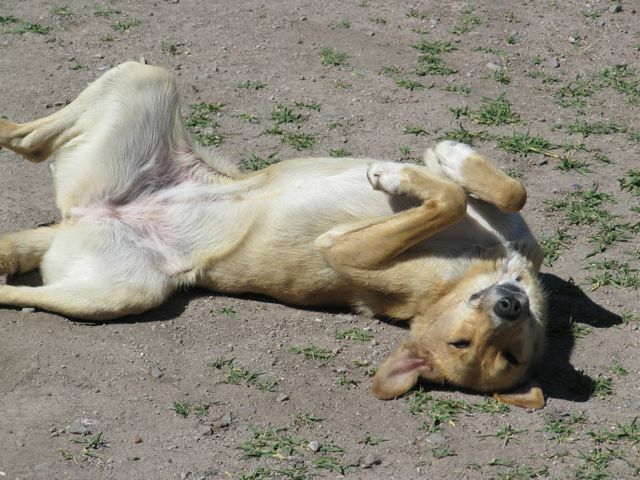 Even this dog of theirs (one of 10) seems contented. Then we met the father, who is an engineer who started studying wind energy 30 years ago. He is 67, and also a handsome, vital, contented-looking person, whose name I also don’t remember. This movable toilet was one of my favorite inventions on the trip. 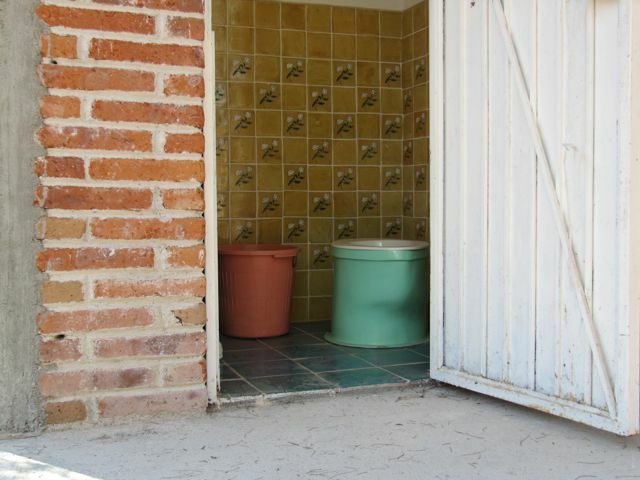 The toilet is set up in a spot, and used, putting screened soil and lime into the 1-meter hole after each use (preventing odors), and when the hole is full, the toilet is moved to another place. The contents are allowed to sit for a period of time, and when fully decomposed, an ornamental tree (only) can be planted in that space. Just outside of their land we were able to see a farmer plowing using a traditional method. 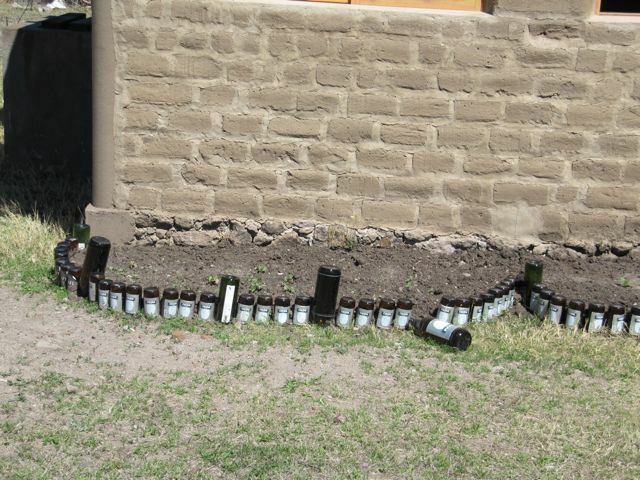 More use of bottles, this time to define a garden area. A house under construction. Note the elaborate system to collect and store rain water from the roof. 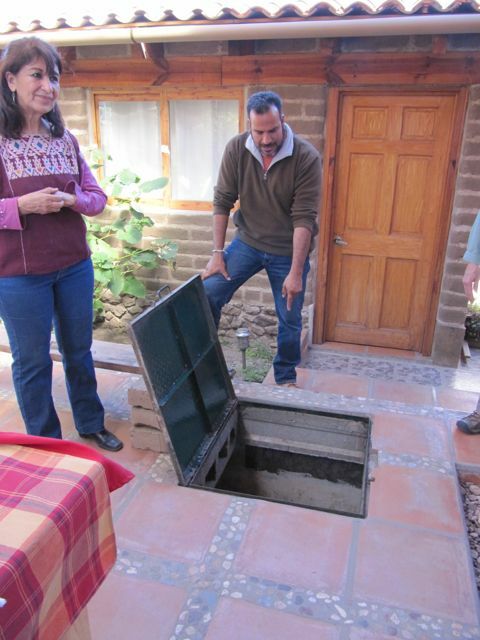 At his parents’ home, Atta showed us the cistern which is under the patio. Atta and his sister each have their own homes on the land, also. 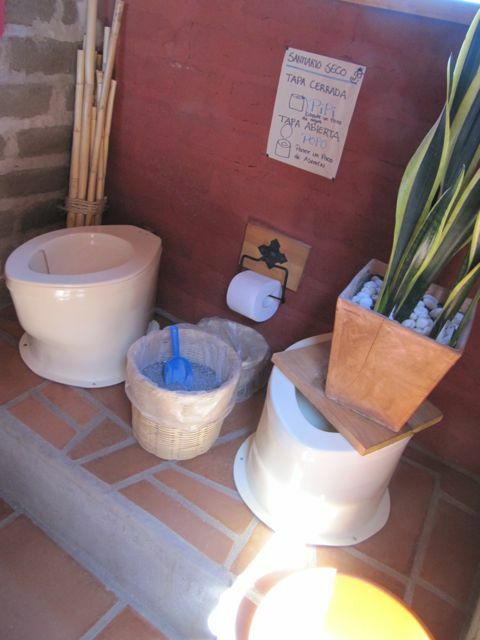 And here is their dry toilet — with instructions — which I had a chance to try. And the inside of their gorgeous home — built completely sustainably. 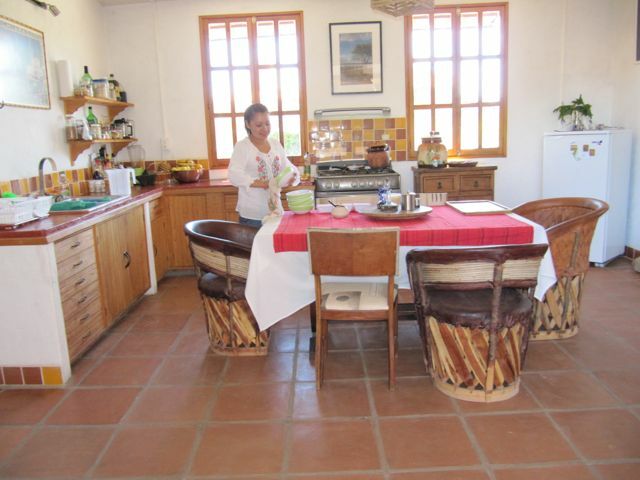 The kitchen, where an employee from the local community was preparing us a snack of fruit, drinks, cake and cookies. During the heat of the day, we sat in their outside living room, snacked, and talked for hours. 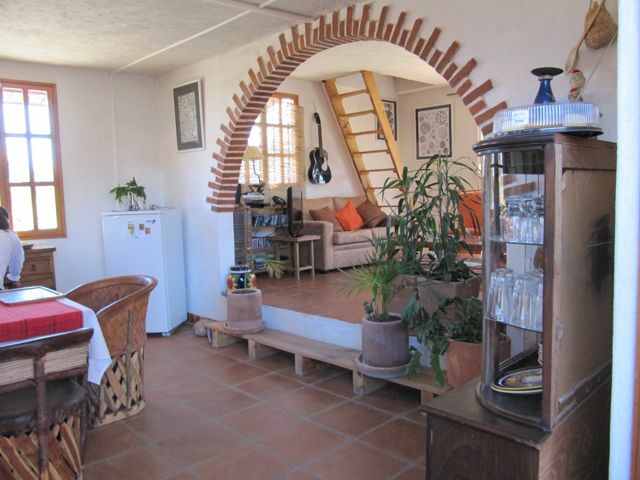 That is a hammock at the top right, which can be lowered for a siesta. It looked mighty inviting to me! Several times during the afternoon, a very high wind would come up unexpectedly, and then die down, and we were told that frequently little tornadoes formed which to date had not done any harm, but the family had identified some areas of their buildings that needed a little more battening down. The family hopes to have a web-site up soon and an internship program. They also hope to build some cabins and have guests for short periods of time. Such a special day, with a most unusual family. An inspiration really. I just hope my that Spanish sounds as charming and endearing as his English! The other day at the Pocket (movie) Theater, there were hamentaschen out for the taking at the ticket table. What a nice treat! I hadn’t eaten them in a long time. It was during Purim, of course, and the movie, “Nora’s Will” (recommended) was about Passover. One never knows in SMA what one will encounter. I went to a wedding reception last Wed. The actual wedding had been a week earlier and a private affair. 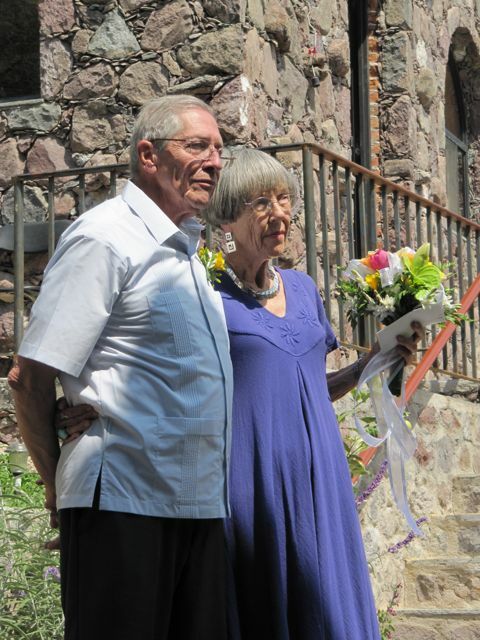 (By chance, I met the couple and the 95 year-old retired UU minister who performed the ceremony and their two witnesses at a restaurant right after the service took place.) It was between Betse, an 85 year-old woman (who would put us all — combined — to shame) and her 70-something husband, Jim, who is handsome and wonderful. I had about the best time I’ve ever had in my life at the reception. When I arrived by taxi at the private home (of a friend of the couple) at 1 p.m., I was immediately offered a glass of wine or a margarita; I chose the latter. 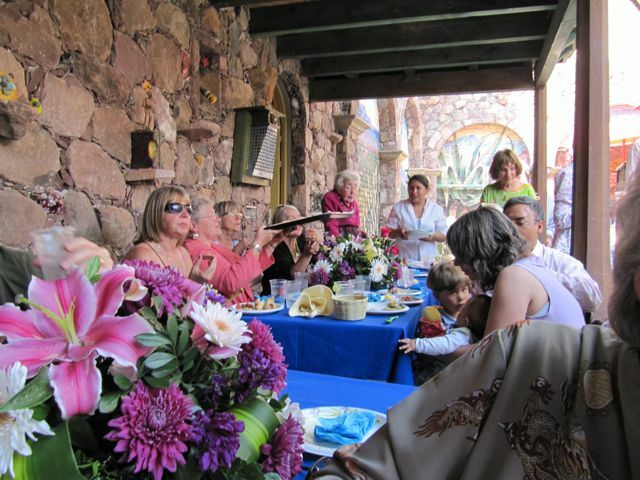 There were tables set up everywhere under the portals and under brightly colored umbrellas with bowls of guacamole, salsa, and tortilla chips. I greeted many friends and then settled down in a shady spot to enjoy the first of the food. Later came barbecued shrimp, small empanadas, stuffed mushrooms, and many more goodies that I can no longer remember, butlered by the Mexican serving staff. More drinks were offered. 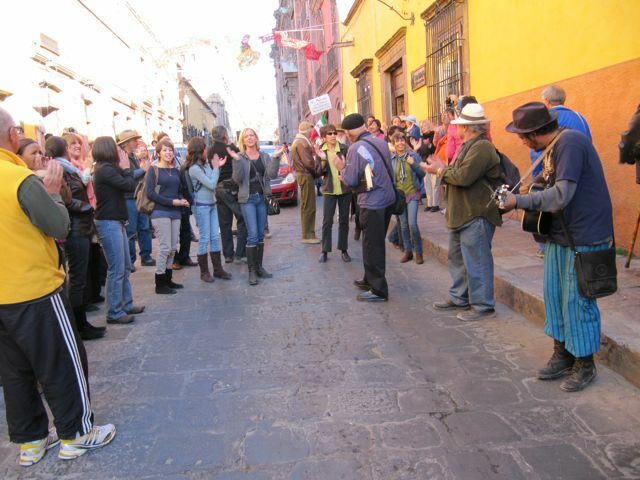 A mariachi band showed up and played for about an hour, as people danced. 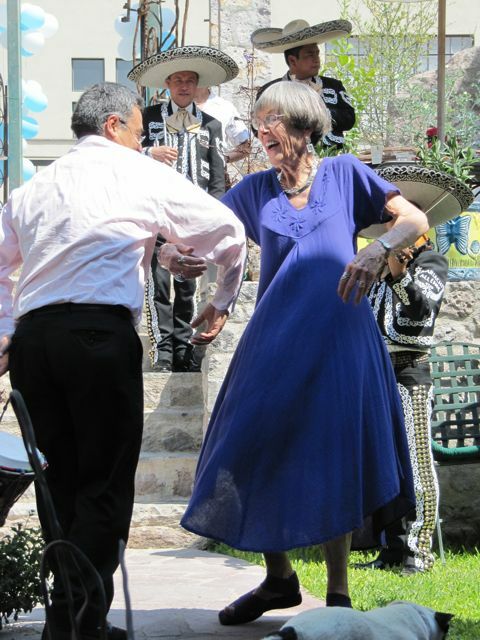 Here’s Betse and a partner dancing to a mariachi tune. Then the hostess invited guests up to a microphone to offer memories, anecdotes, and best wishes to the couple. Here’s the Rev. 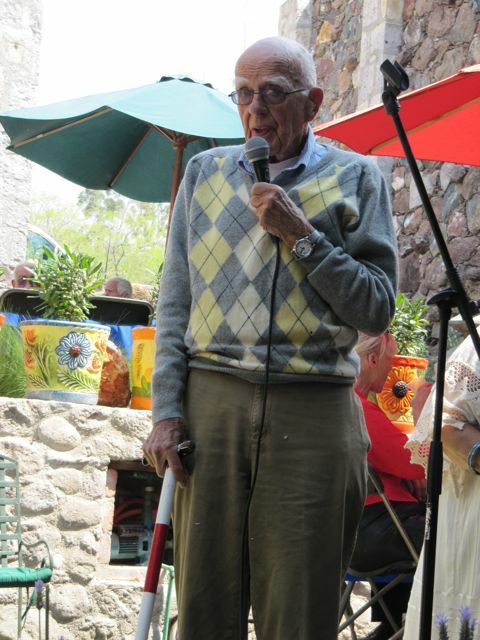 Farley Wheelwright, 95 years old, almost completely blind and deaf, but TOTALLY with it and an amazing human being. He had performed the wedding service. And here is the happy couple, Jim and Betse, during a solemn moment. 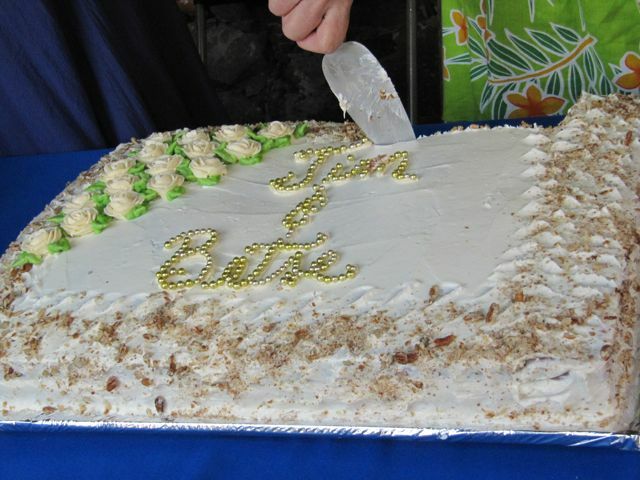 Betse herself got up and said, “I’m in the place I really want to be and with the person I really want to be with.” Jim said, “Betse was the only woman who didn’t bring me a casserole when my late wife died.” That brought down the house! Betse had been widowed a long time ago, Jim more recently. A friend of mine, Jon, a professional photographer in his former life, took this great photo of me. It’s the most dressed-up I’ve been here — in my Mexican cotton shirt and flouncy black Mexican cotton skirt, my San Miguel party shoes, and my magnificent silver & turquoise necklace and matching earrings. I hadn’t had an opportunity to wear them before. This delicacy was a carrot cake, and super delicious! And served with a champagne toast. Let me tell you, margaritas and champagne in the heat of mid-day pack quite a punch! Luckily, I had a couple of hours to get myself together before I had to go teach at 6. Would you believe my hairdresser was at the reception, since he’s also Betse’s hairdresser? And then the next day, I had lunch with a friend in a restaurant that also has a bakery. She admired my haircut and asked where I had it done. I did a big sales job on José Marín, and then as we were leaving, we ducked into the bakery to look — just to look — and there was José, who asked if I were following him, since we’d just met the day before. Marg told José that she was going to call him for an appointment as soon as she got home, and she did. 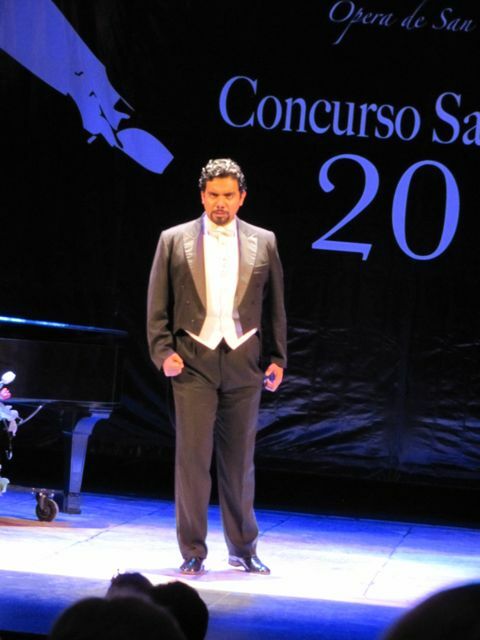 I learned of Concurso San Miguel 2012 long before the scheduled date of March 3 for this national final competition of young opera students. This was the fourth year of the competition, and it was returning to SMA after a year in another city. Excitement was running high. As soon as it was announced that tickets were available, I rushed to the Angela Peralta theater (steps from my rental) only to discover that all of the seats in la luneta (orchestra) at 250 pesos (about $20 USD) were all sold out. How was that possible? Of course there were cheaper seats in the nosebleed section still available, but then again, they’re not really seats, but long benches that are intolerable for me. I’ve tried them, and once was enough. I decided to go early the night of the performance and see if anyone had an extra ticket I could buy. I knew that people get sick, change their minds, their guests don’t come, etc., and I was right. I went over to the theater at about 7:15 for an 8 p.m. performance. People were already lined up to get in, as it was open seating within each ticket section. The first person I asked, who had a fistful of tickets in her hand, had an extra, and sold it to me at cost! What superior luck. 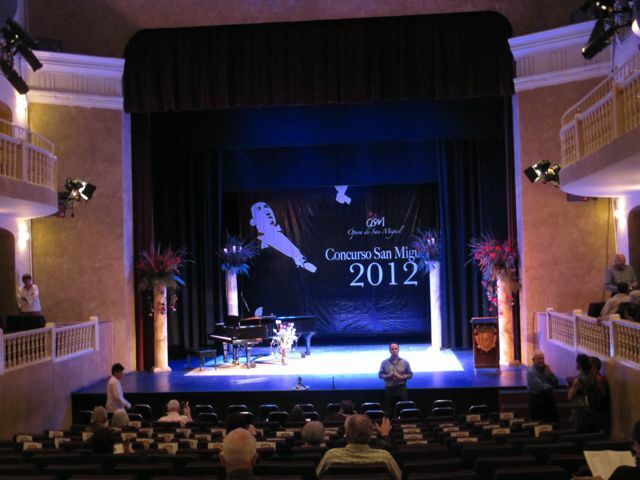 Here is the inside of the theater, named after the operatic soprano of international fame of the 19th century, Angela Peralta, who came in person to inaugurate the venue way back then. She was called the Mexican Nightingale in Europe, where she sang to acclaim in opera houses there before the age of 20. She was also a composer, an accomplished pianist, and a harpist. She died at the age of 38. Precious few operas have been staged there since then, so it was with particular relish that this theater was used for the competition. One of the sponsors of the event was a new flower shop in town, Xochi, so there were lush, magnificent flower arrangements gracing the stage. 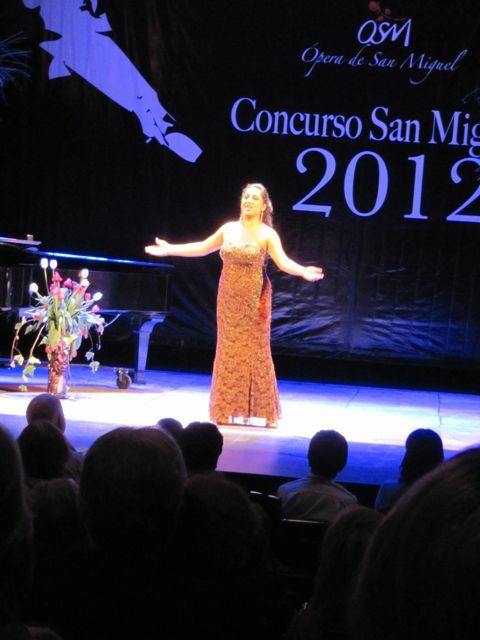 The concurso was open to opera students throughout Mexico and Mexican nationals living in the U.S., Canada, and Europe. There had been 200 applicants, and they had been winnowed down to the 12 who performed that evening. Special guests were recognized from the stage before the singing began, and the Italian ambassador to Mexico and his wife were seated fairly close to me. This was a big deal! The plan was this: each contestant got to sing twice, presumably in an order selected by lottery. They sang in a different order in each of the two halves of the program, in a different language, and sang arias by different composers. 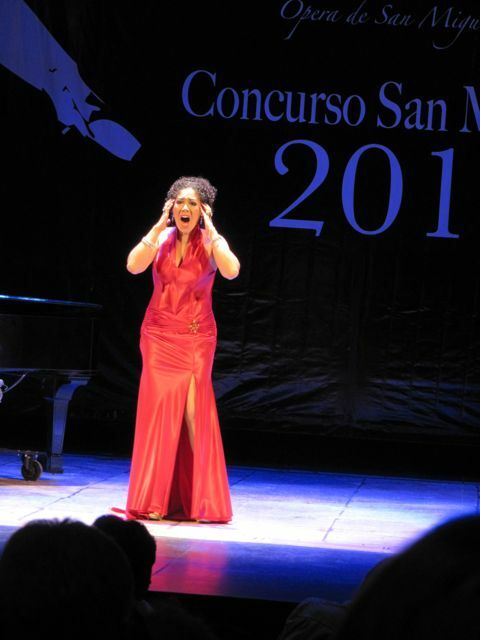 This was the eventual winner of the concurso, and you can see her marvelous dramatic performance. Her prize was many thousands of pesos (perhaps 15, I don’t remember) and a debut with the Acapulco Opera Co., with all expenses paid and a honrarium of 15,000 pesos (a little under $1200 USD). Quite a nice prize! This handsome fellow was also really good. All of the contestants were nervous, and in my opinion, all improved on their second appearance. There were professional opera singers and musicians as the official judges, of course, but we the audience members were given ballots to vote for our personal favorites. The woman I voted for was the winner of the audience ballot. During the intermission, all of the women changed their gowns, so that was fun to see. 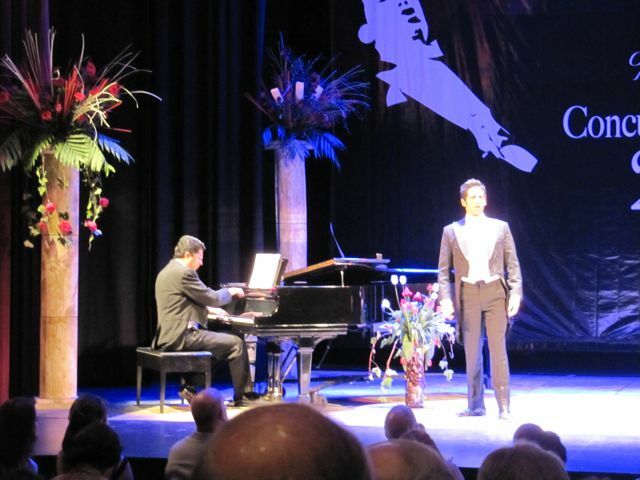 And all of the singers, and the extraordinary piano accompanist, whom I’d heard at other musical events around town, were dressed in tuxedos with tails. In San Miguel de Allende! It was something to experience, let me tell you! While the judges tallied their scores, we were entertained by four very young opera students (all were only 20 years old), the woman below being one of them. 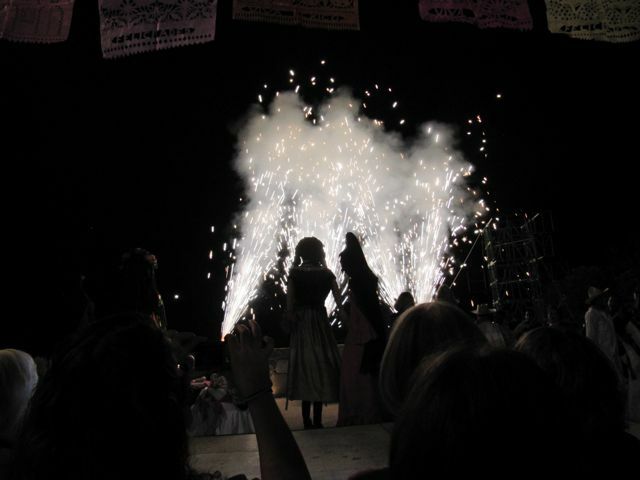 Based on their performances, opera in Mexico is in very good shape. 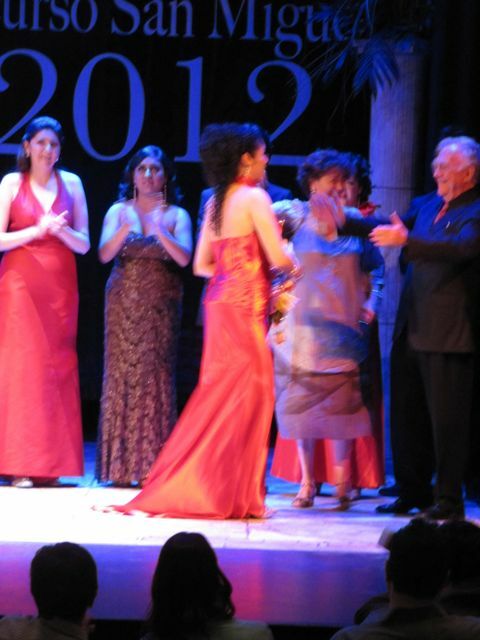 All of the contestants returned to the stage to hear the announcement of the awards. Although the program was run like a tight ship, the entire evening was 3 1/2 hours long, although it did not seem that long. All announcements had to made in both Spanish and English, of course, so that took a little more time. 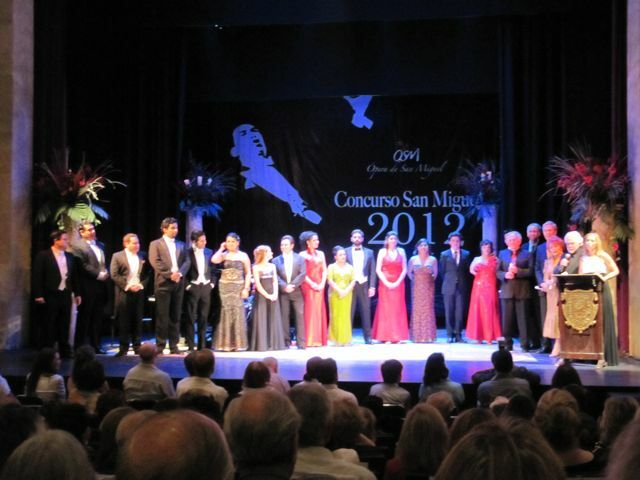 The short woman in the yellow gown was the winner of the Audience Award. There were also fourth through first place winners, and a special Encouragement Award. And here is the first place winner receiving congratulations on her spectacular performance. When I lamented in an earlier e-mail that there was no photo of me in my “Raffle Queen” get-up (decorated foam crown and special bag), presto, one appeared in my e-mail in-box (thank you, Paula!). So here I am, looking like I don’t have any hair at all, but having a good time. 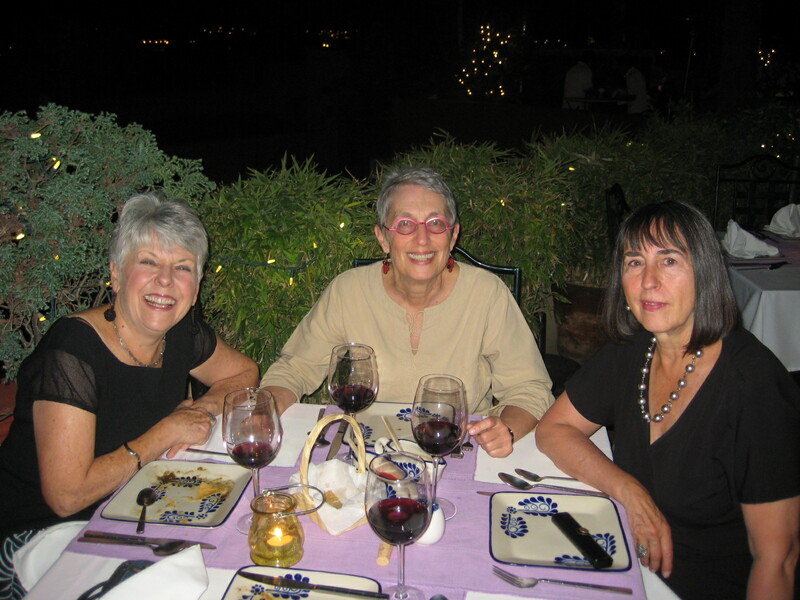 Here’s a much better one taken at the last dinner at one of my favorite restaurants in SMA — La Posadita — with new and now dear friends. When I knew I was going to be in SMA for almost six months this year, one of the first things I did in September was to go to Office Depot here and buy an HP laser printer. As usual, the printer was quite inexpensive ($80USD), but the replacement toner cartridges cost $100USD. That’s how all of the printer companies make their money; I think it’s a complete rip-off, but I know that’s just the way it is. Earlier this month, I began to get messages from my computer that my toner was low. I remembered that a friend here had told me that there was a computer store on Calle Canal that refilled toner cartridges for about $10USD, so I took my cartridge out of the printer, and following her directions, went to find the store. It’s about four blocks away on a very steep street going down away from my house. Because of centuries of walking on the sidewalk paving stones, they are a bit slippery, and because the street has quite a downward pitch to it, I walk very, very carefully. Coming up is not slippery, of course, but a workout for the lungs and heart. 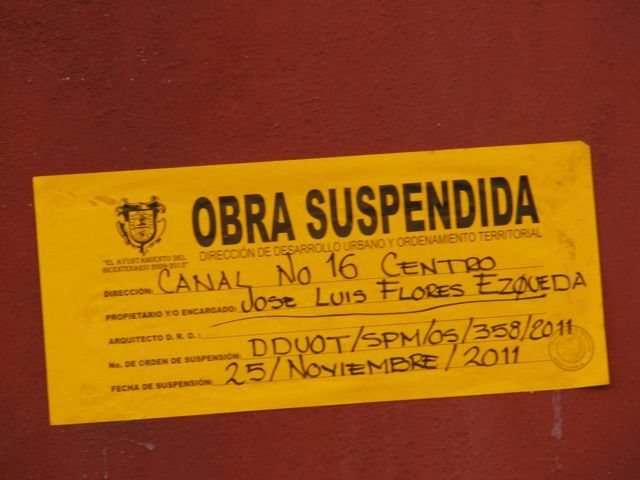 A bus runs on Calle Canal, but since it’s a one-way street down-hill, there is no point in taking the bus down. To take a bus coming up a near-by street would just add too much time and actually more walking in the long run. The very nice young man in the store confirmed that they could re-fill my cartridge, but that they would have to order some kind of chip for it to allow my printer to recognize it once they opened it up to re-fill it. He said it would probably take about a week for the chip to come in. I gave him the cartridge, the model # of my printer, my name and phone number. Foolishly, I did not get their phone number, the name of the shop, or the man’s name. After about 10 days had gone by and I hadn’t heard from him, I walked back down. “Not yet, Señora, maybe mañana.” Now, at this point, it’s important to review what “mañana” means in Mexico. It does not mean “tomorrow.” It only means, “Not today.” So every couple of days, I would walk down since I was thinking that maybe they’d lost my phone number, and every time they’d say, “Perhaps mañana.” After 17 days of this, I was beginning to get a little hot under the collar. (By this time I had the shop’s name (Galaxy), the phone number, and the salesman’s name (Jorge), but phone conversations in Spanish are still a bit of a challenge for me, so every time, I would go in person. When I told him that I was leaving Mexico soon and had some stuff I had to print out before I left, he suggested another option: a reconditioned, filled cartridge from the factory. Why didn’t he suggest that 17 days earlier? Perhaps because what I said I wanted was a re-filled cartridge to save money. Perhaps because it cost about $50USD, and the re-fill when the chip came in was going to be much, much less. But $50 is still half of what I’d have to pay at Office Depot, so I took the reconditioned one. Of course, not expecting to be charged 665 pesos, I didn’t have that much with me, so I walked all the way back home and then back again with sufficient money in hand. I asked for my old cartridge back to re-cycle, but he said that they send them back to HP to be re-conditioned. That was fine by me. By this time, I had probably walked there five or six times, using up much of my time, energy, and good will. When I got home, I popped the cartridge in and behold! it worked. I had been keeping a list of things I needed to print out, and I got to work on them. After about 10 copies, my computer started telling me the old message, “Low toner,” and did you hear me screaming all the way from Mexico? That was on Friday. I didn’t have time to go during the weekend, and you always have to remember that Mexican-run stores close for siesta between 2 and 4 p.m. First thing Monday morning, I walked the re-conditioned cartridge down to the store. I totally over-shot it by a block, not able to recognize where it was because…it was closed! So today I returned a little later in the day, after yoga, and told Jorge my sad story. He said not to pay the message any attention, that computers sometimes tell you that with re-conditioned cartridges. I suggested that in the future, he tell his customers about this, but he said it didn’t happen with all printers and computers. Just mine, I said under my breath. Was he telling the truth? Only time will tell. Anyway, I have surely spent ten times the $100USD I would have spent in Office Depot in my time, my effort, and my energy, and I have learned a lesson. Just bite the bullet and buy the damned new toner cartridge at Office Depot. The patience lesson: I think I’ll have to take a make-up class. A friend of mine from Nova Scotia, Karen, whom I met here several years ago, came for a week-long visit. We were in perpetual motion while she was here. Our best day, in my opinion, began with a very early morning visit to El Charco del Ingenio, the local botanical garden, with another friend, Chely, a sanmiguelense who lives in Montreal with her husband. We met at the jardin at 8 a.m. and spent about two hours at El Charco. 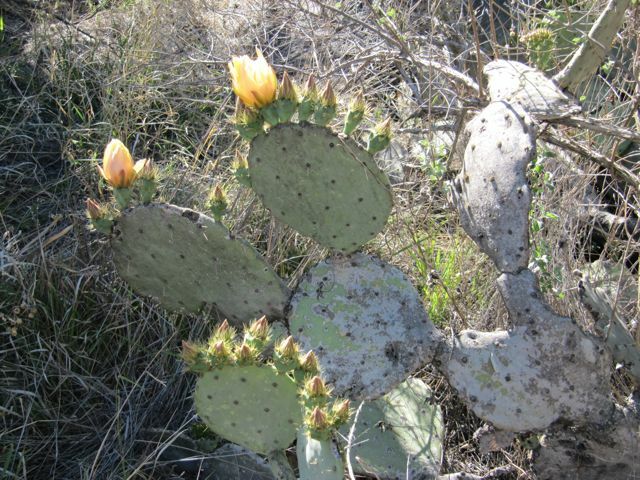 It was magical at that time of day: not yet hot, lots of birds to see and hear, ducks in the water, a braying donkey somewhere off in the distance, a brilliantly blue sky, and the extraordinary display of blooming cactus, thanks to the rain we had unexpectedly had some weeks earlier. Karen on the left, and Chely on the right. When it began to heat up, we headed back home and I said goodbye to Chely until next year, as they were leaving soon for Buenos Aires for a month before heading back to Canada. Karen and I packed up our swimsuits, towels, flip-flops, hats, and sunscreen, and headed out by taxi for La Gruta, one of several hot springs in the area. There we just floated in the deliciously warm water in various pools under an achingly beautiful sky, chatting with others; went into the grotto for a short time for very hot water, but skipped the hottest water gushing out of a pipe overhead onto aching backs and shoulders (of others). We had a nice, relaxed lunch, sat around talking and reading on chaise lounges, and I was about as relaxed as I can ever remember. 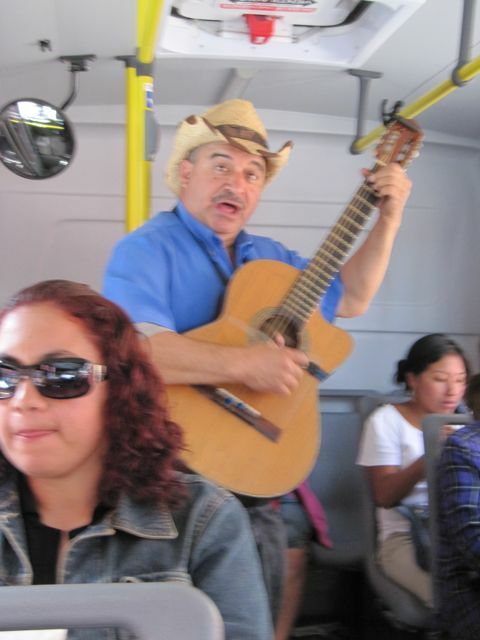 One day before Karen came, I was riding the bus somewhere and I heard a rooster crow in the back. I swiveled my head around and saw that it was a guitar player/singer about to begin a song. I whipped out my camera to capture this image. The second song was about Mexicans going to El Norte to work and “La Migra” (the US Immigration Service) saying they couldn’t work there because they didn’t have papers. At the end of the song, the would-be workers were urged to come back to SMA. Several other bus-riders looked at me to see if I could understand and how I was reacting. I had understood and I just smiled and raised my hand in solidarity with the message to come back home to SMA. When the guitarist passed the hat, I put some coins in. We in SMA have probably been in one of the safest places on the planet since last Thursday. Why? 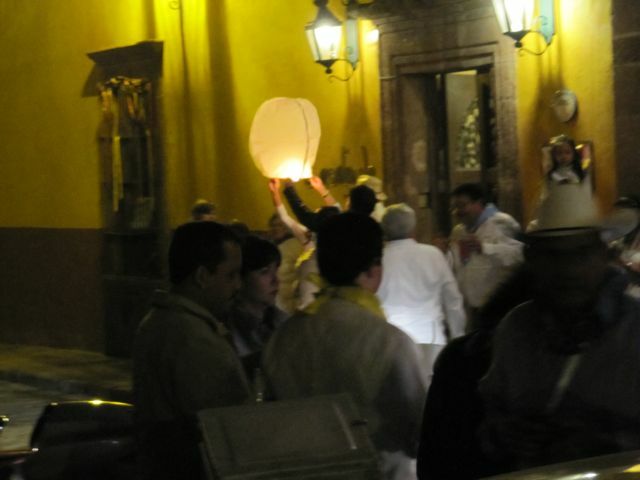 Because the Pope came to Guanajuato, only about an hour away, for four days. The President of Mexico greeted El Papa there, then came to SMA to stay at the new, wildly expensive, and prestigious Rosewood Hotel for the weekend. 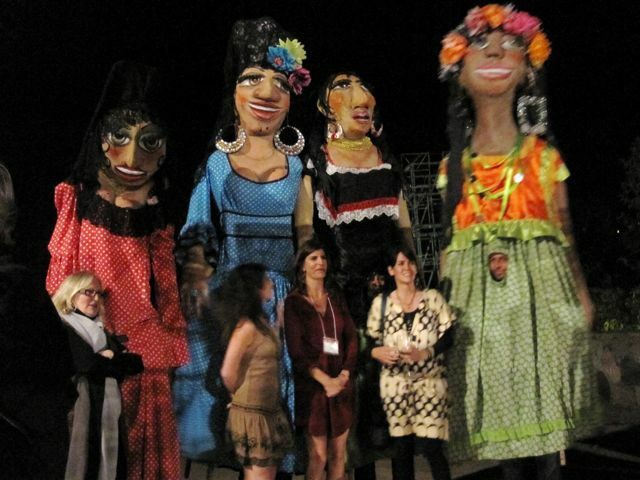 And Malia Obama was in Oaxaca for spring break with 25 Secret Service agents. Thank goodness the 7.4 earthquake in southern Mexico didn’t interfere with any of that. There were policia and soldatos, federales and men in suits and sunglasses and more black Suburbans all in one place than I’ve ever seen in my life. It felt like the town was in lock-down. Thank goodness all of the commotion is over now. Perhaps you remember from one of my earlier e-mails that an older Mexican woman was killed by a bus fairly near to my house and that there was an immediate response in terms of making a very crazy corner much safer for everyone. It feels so much better to me now when I have to cross there. A couple of weeks after the death and the new safety measures, I noticed a cadre of men and women wearing vests that said “Accident Prevention Team” (in Spanish, of course) observing the area and taking notes. I’m pleased with this excellent reaction to a tragedy. I was thrilled to be invited for comida (big meal at about 2 p.m.) at the home of Carlos, my Spanish teacher of three years, and his wife, Claudia, whom I had met a couple of times before. They live about a 15-minute walk away from my rental. We started out with guacamole, chips and limonada while we chatted in the living room. 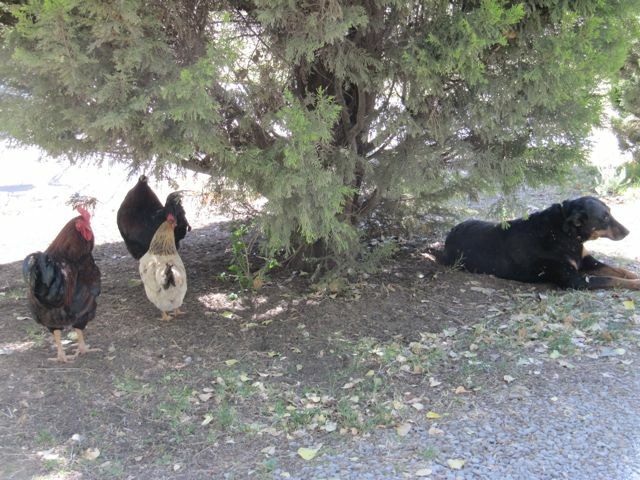 Their immense German shepherd lay in a shady spot just outside the back screen, and never barked at me, a stranger. Then we moved into the dining room for broccoli soup and my all-time favorite, enchiladas verde con pollo (green enchiladas with chicken). Claudia asked how many enchiladas I wanted and I said two. They both laughed at me and I got four on my plate. Since I was already a bit filled up with the food that had gone before, I really could eat only two, so I got a doggie bag to take home. Carrot cake for dessert. Yum! Claudia is a terrific cook. After more conversation in the living room after the meal, their grown son, Charlie, a newly-minted attorney with a new short-term job for the election which is coming up in July, came home to eat. After hearing about him from Carlos for all of those years, it was indeed a pleasure to finally make his acquaintance. I left soon after that, but I’m proud to say that even though everyone in the house spoke English, we spoke Spanish the entire 2 1/2 hours. 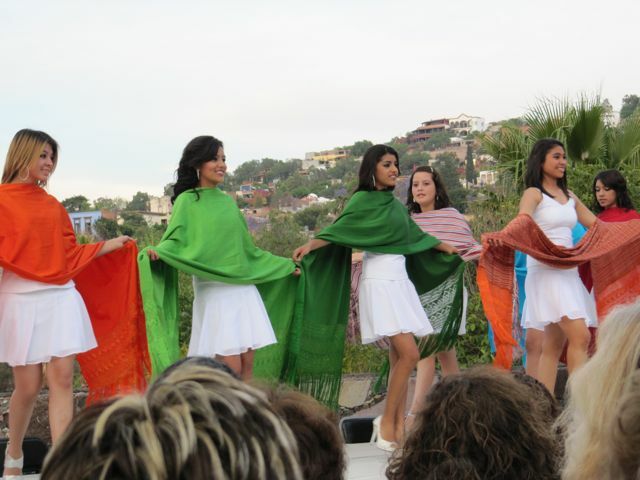 One evening during Karen’s stay, we attended a rebozo fashion show at the Instituto Allende. We had no idea what to expect, but it turned out to be amazing. As you’ll see from the photos below, it was a well-choreographed, highly professional display. It doesn’t hurt to be 18, Mexican, and gorgeous, either, while demonstrating the 250(!) 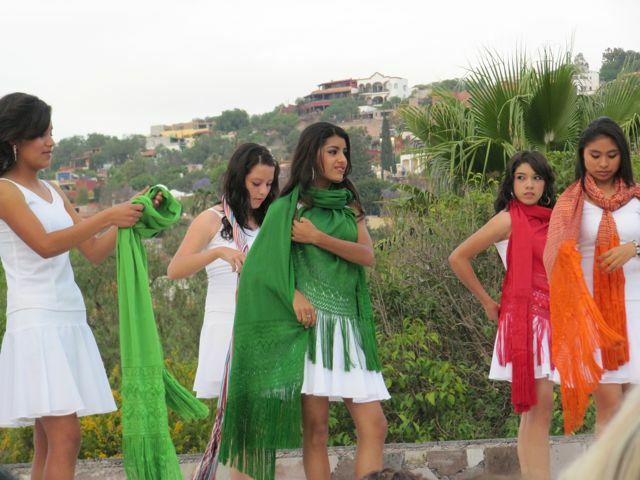 ways that a rebozo can be worn. Of course they were for sale afterwards. We looked, but we did not buy. I gave a “meet Karen/farewell to SMA” fiesta for 10 friends up on the communal terraza here the evening before Karen was to leave. Karen and I spent the day picking up pre-ordered Lebanese food; buying, disinfecting, and preparing into a dessert lots and lots of wonderful fruits; buying cheeses and crackers at what turned out to be three different stores; hunted down some elusive items like nice paper plates (they call them cardboard plates here, which is probably more accurate); chose wines; and waited for the cupcake delivery. 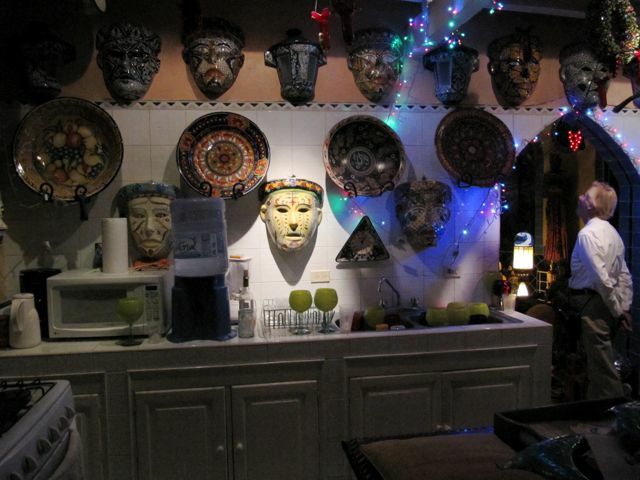 Then we figured out on and in what to serve everything, making quite creative use of the serving things on hand, but also some decorative items in the apartment. It was quite a lot of work, but with Karen’s help, it wasn’t too bad at all, and we had a lot of fun. 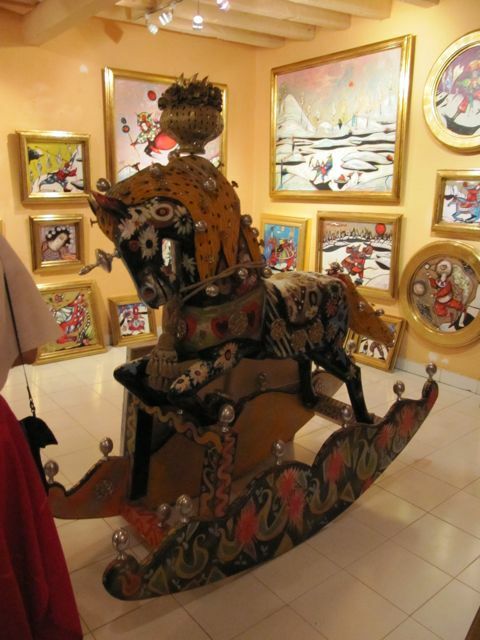 We called the party for 5 p.m., because there was an art opening at the home of Toller Cranston from 6-10 p.m. that Karen and I certainly wanted to attend, and as it turned out, so did everyone else. 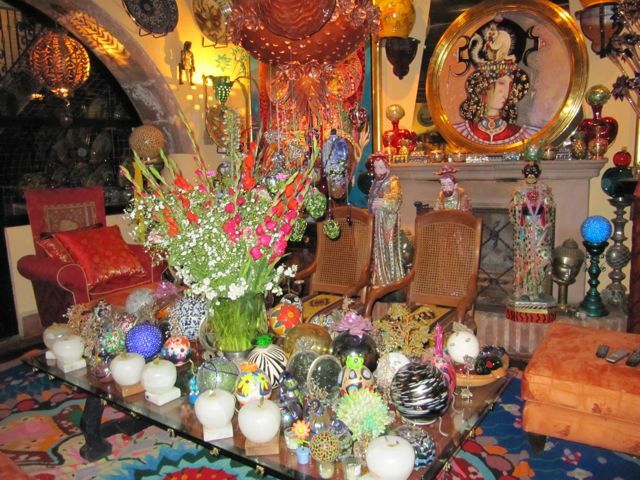 Who is Toller Cranston you might ask. If you are Canadian, you know. If you’re not, here are some quick facts from Wikipedia. Toller Shalitoe Montague Cranston, CM (born April 20, 1949) is a Canadian figure skater and painter. He is the 1971-1976 Canadian national champion, the 1974 World bronze medalist, and the 1976 Olympic bronze medalist. Although, because of poor compulsory figures, he never won a world level competition, he won the small medal for free skating at the 1972, 1974, and 1975 World Figure Skating Championships. Cranston is credited by many with bringing a new level of artistry to men’s figure skating. He rotates clockwise. Cranston was inducted into the Canadian Olympic Hall of Fame in 1976, the Canadian Figure Skating Hall of Fame in 1997, the Order of Canada in 1977 and Canada’s Walk of Fame in 2003. He was inducted into the World Figure Skating Hall of Fame in 2004.Growing up, Cranston had an uneasy relationship with his family, especially his mother who was also a painter and who had a domineering and self-centered personality. He later compared his childhood to “being in jail.” In school he had the habit of asking provocative questions that made his teachers think he was being disruptive. Although he enjoyed history, he disliked more structured subjects like mathematics. After high school, Cranston attended the École des Beaux-Arts de Montréal. By his third year, he became restless with his studies. One of his teachers suggested that there was nothing more he could learn at the school, so Cranston set out at that point to establish himself as a professional artist. In 1976, he teamed with personal manager Elva Oglanby to write his first book, Toller, a mixture of autobiography, sketches, poems, paintings, humour and tongue-in-cheek observations. It reached number two in the Canadian non-fiction charts. Cranston co-wrote the autobiographical Zero Tollerance (1997) with Martha Lowder Kimball, and a second volume, When Hell Freezes Over: Should I Bring My Skates? (2000), also with Kimball. While he described a sexual tryst between himself and Ondrej Nepela in the second book as well as affairs with women, in his books he presents himself as having lived without forming strong romantic or emotional attachments. As of 2010, he lives in San Miguel de Allende, Mexico, where his main artistic outlet is now his painting, which often incorporates themes related to skating. 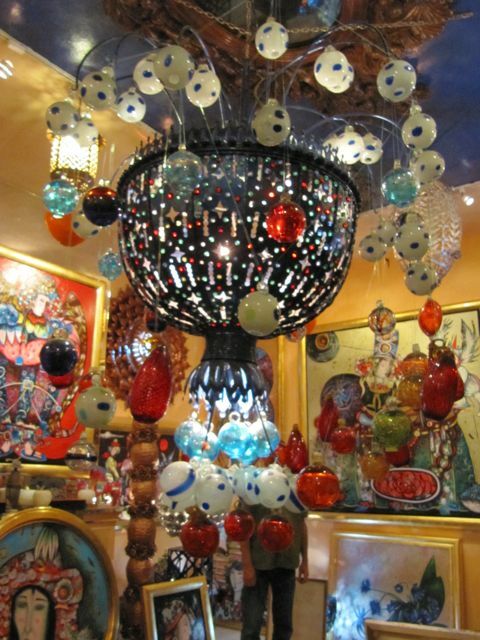 In addition to painting, Toller works as an interior decorator, among other creative things. My landlady hired him to decorate the unit she owns next door, where I’ve stayed, and there is even a plaque on the entry door testifying to it. He is, to say the very least, a character. At about 7:45, we all carried the remainders of our feast back down to the apartment and headed off to Cranston’s home for the exhibit of the work of a student of his, Susan Zambiasi. He has an immense spread (several acres, which is unheard of in downtown SMA) in a very posh neighborhood just off of Parque Juarez. 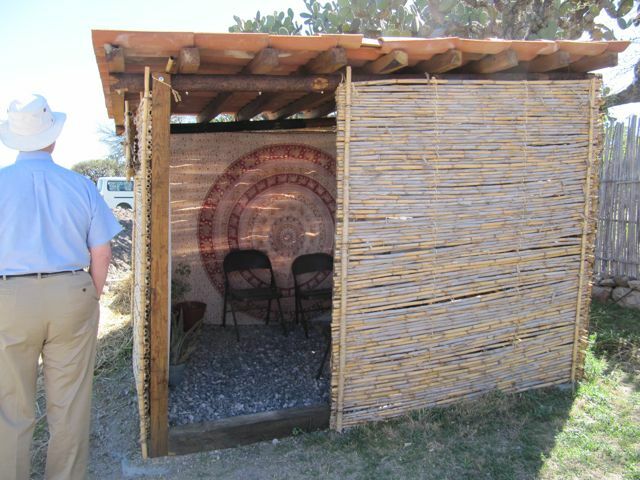 In addition to his palatial home, he has at least three or four casitas on the property which he rents out. 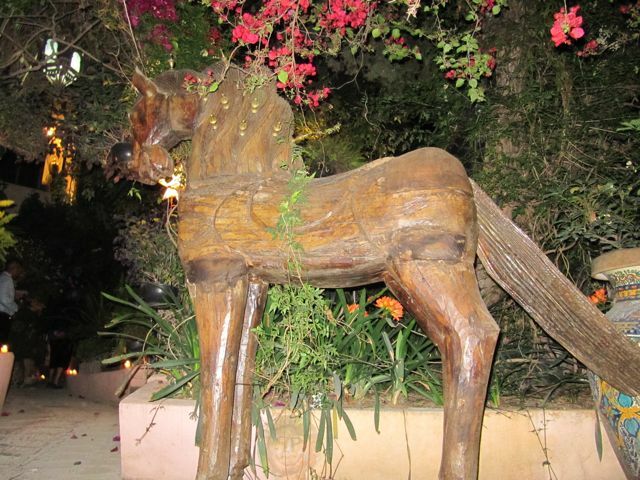 This magnificent horse made of wood was what greeted us just inside the gate, which was staffed by a welcoming Mexican man. 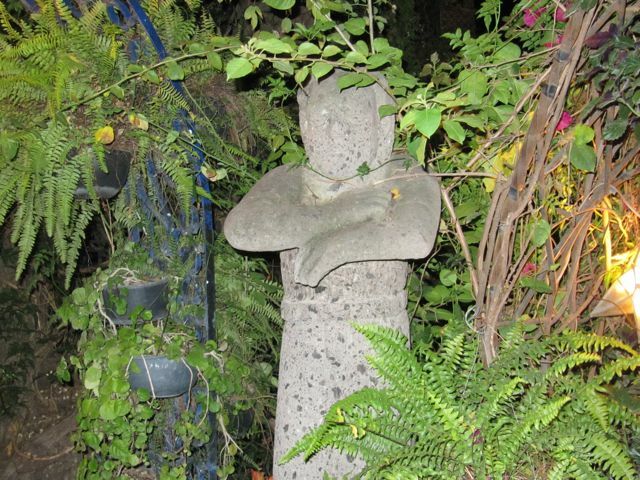 This fellow also stood guard in the jungle-like garden at the entrance to the property. 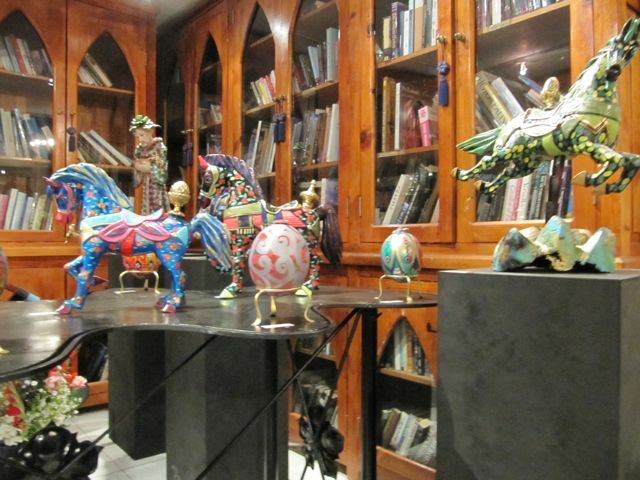 Susan Zambiasi’s work on exhibit included these Faberge-like eggs and intricately-decorated wooden horses (you’ll see them in a minute). This, as you may be able to see, is the kitchen! Still in the kitchen. There is something in every single square inch. I find that style of decorating exhausting. There is no empty space for your eyes to rest on. 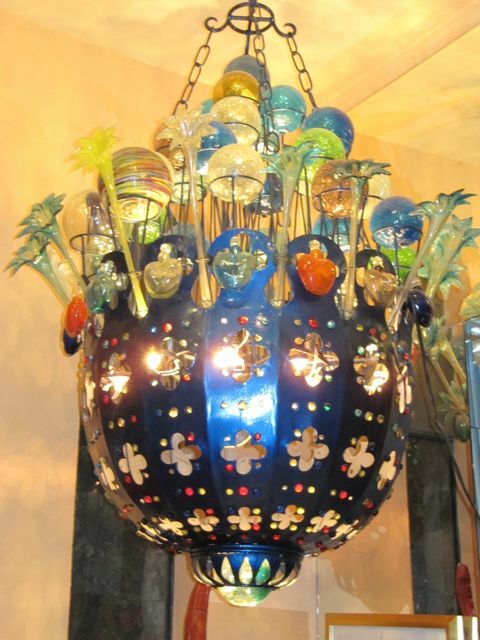 There were many of these Dale Chihuly-like chandeliers. It’s unclear to me whether or not Toller made these or bought them. 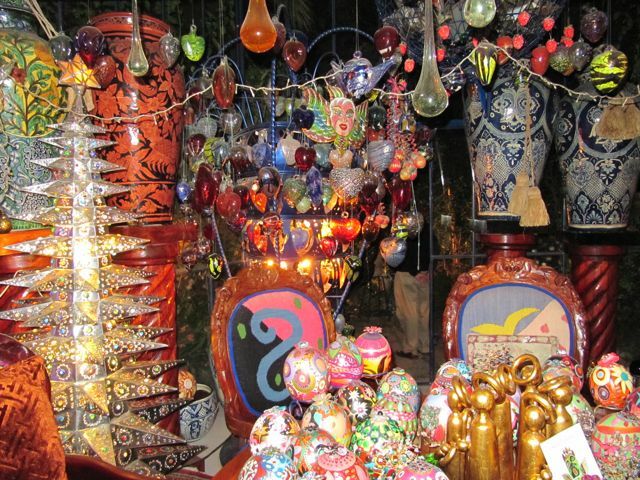 He told us that he likes “things” very much (no kidding), and when he goes into a store, he cannot buy just one thing, but all of the things, but he also made an incredible number of the items he has in his home. These three guys were one of my favorite groupings. 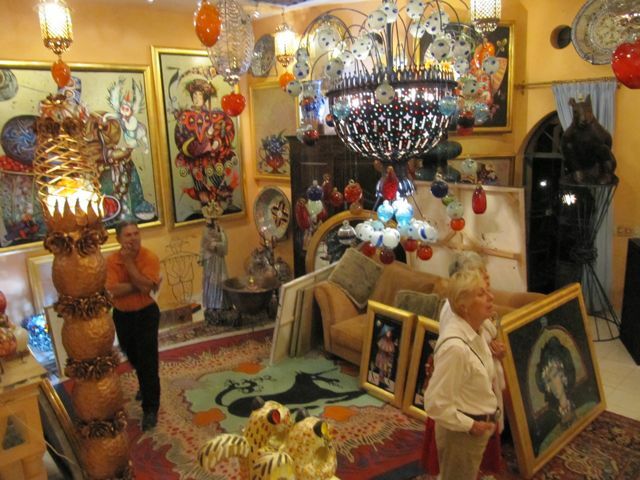 Finally, we got to the sales gallery in his home. 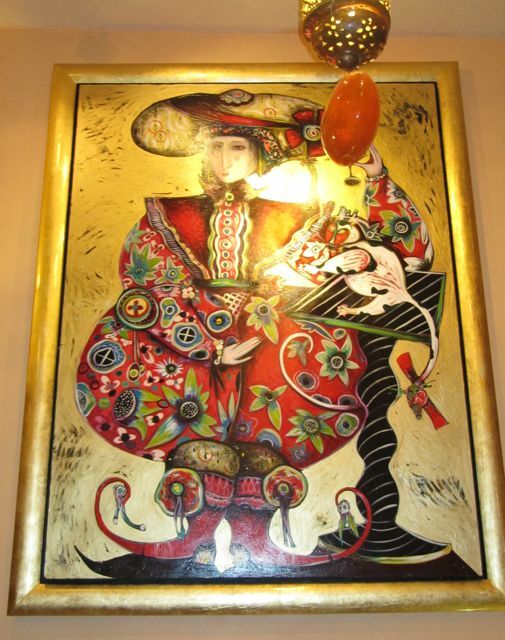 Those are his paintings on the wall, which have a very definite style. Obviously Toller also likes horses. Here is Toller in the center in black and white. My favorite space in a home like this is the outdoor living room. They just look so inviting, and this one is so wonderfully uncluttered, as compared to the inside spaces. 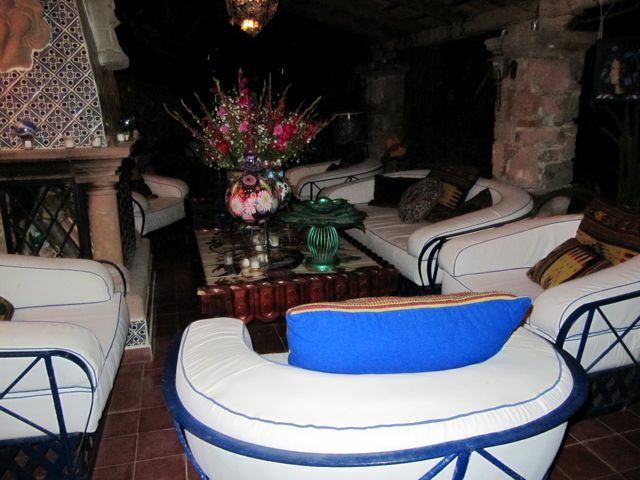 I can’t imagine how his staff keeps these slipcovers so clean and white. 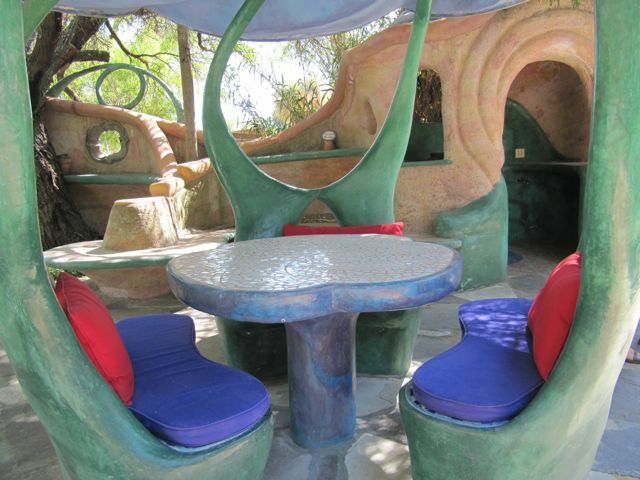 A friend laughingly said that if you rented one of his casitas, you’d need to take an Ambien to get to sleep because of all the visual stimulation. This massive fish was guarding the swimming pool. 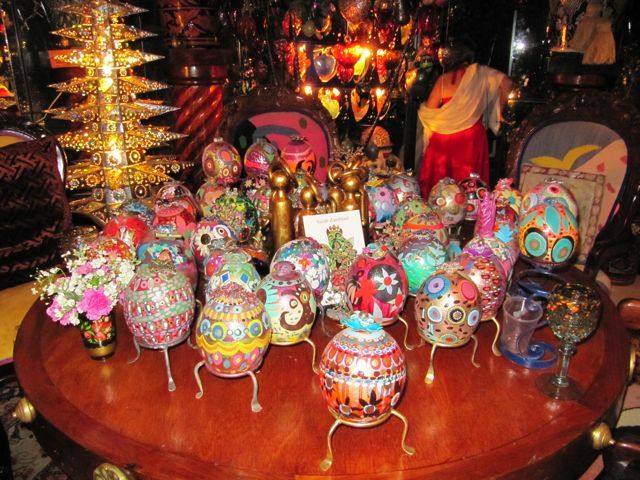 Some of Susan’s horses and eggs for sale. I really did like the horses, but of course have no need (or desire) for one. The evening was far from over. As we entered my street, Mesones, there were throngs of people seemingly celebrating a wedding. Why in the street, I never found out, but I think maybe the wedding party was adjourning to the Mint nightclub directly across the street from me. We saw a custom that was new to me, the launching of small hot air balloons. Several of them did get up, some quite high, but others just burst into flames. We won’t even begin to talk about the danger to those around from this practice. Karen and I, plus a bunch of other tenants from my complex, stayed well away on the opposite side of the street. 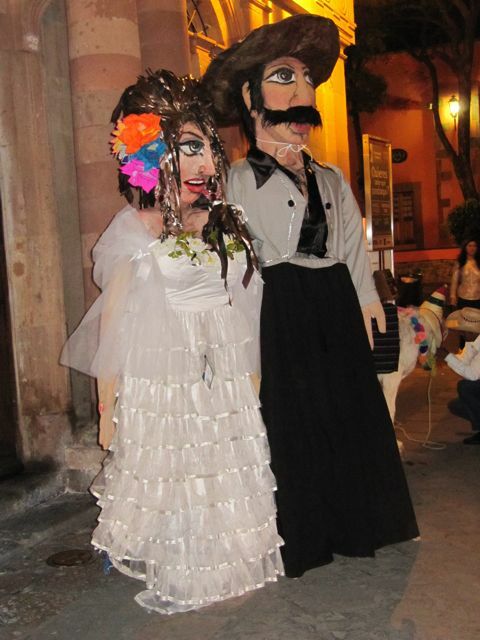 The mojigangas, dressed here as the happy newly-weds, are present at every celebratory event. Karen left early Friday morning. 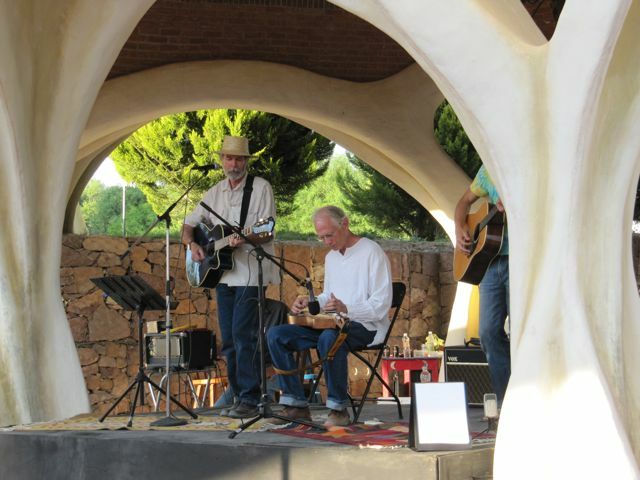 That afternoon at four, I attended a music festival about a half-hour out of town for the benefit of hospice. Transportation was provided from the Fábrica Aurora at half hour intervals starting at two. 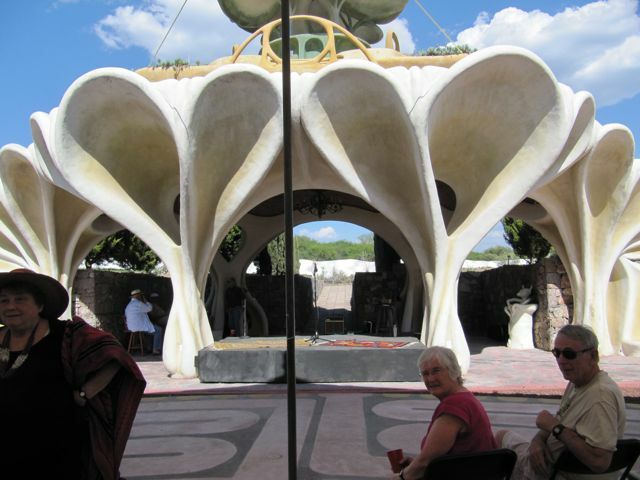 We were let off at a Gaudi-esque home I’d visited some years ago on a Saturday Adventure. And here is the welcoming committee. 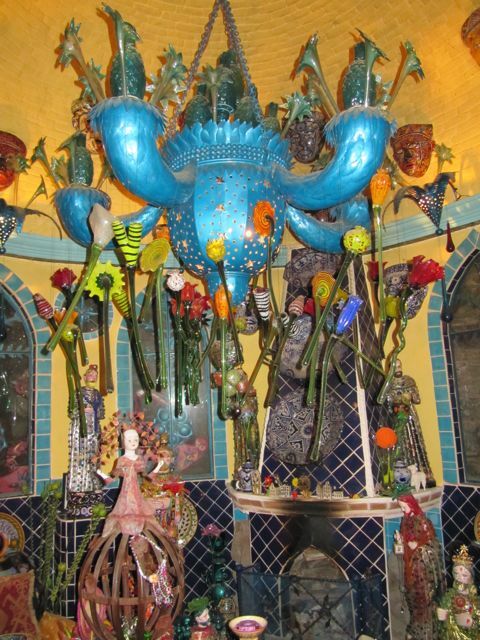 After gawking at this most unusual house, we walked next door to Jennifer Haase’s folk art museum, which I’d also visited in past years. Another stroll around it was certainly called for, though. 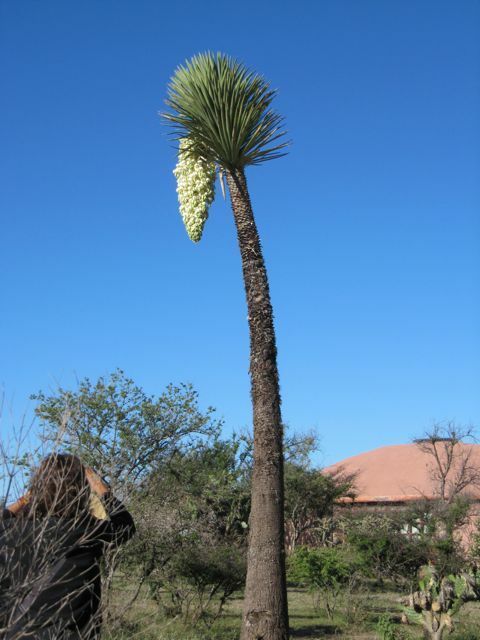 Then it was another short walk to the cactus farm next door to that. 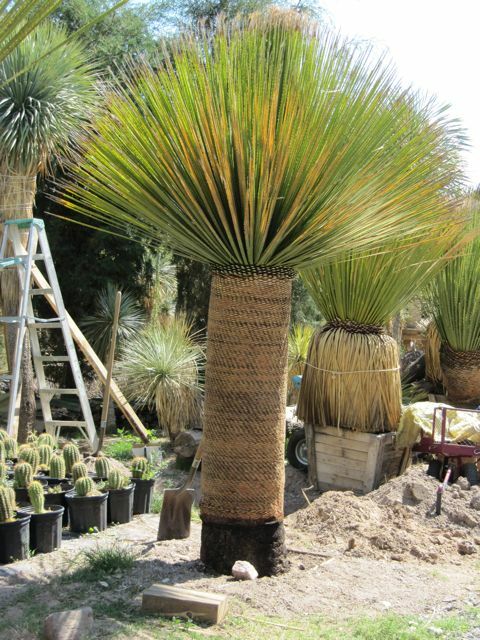 Who knew cacti could be coaxed into shapes like these for fancy gardens. And the lion and the lamb shall lie down together (in the shade, natch). 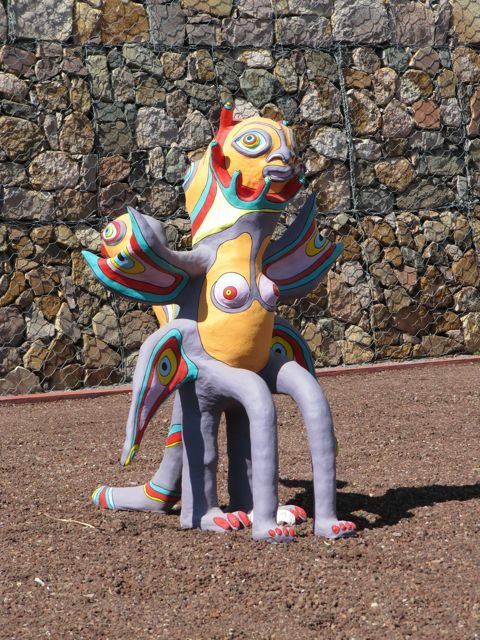 Finally, we got to the site of the music, and another welcoming gaggle of most unusual statues met us. 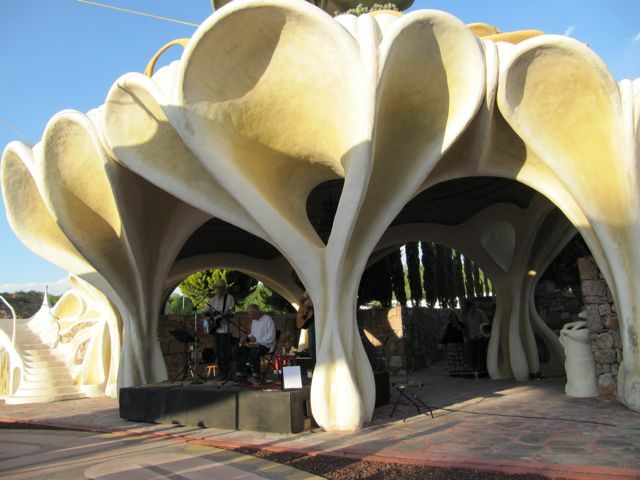 We were told that this was the first time that a music festival had been held here. That really surprised me, as why else would you build an amphitheater such as this? You can perhaps see that a Buddhist labyrinth is painted under the chairs. A huge white cover was overhead and on a pretty stinking hot day, we were very comfortable. There was almost always a breeze. The level of musician-ship was quite extraordinary. I loved the combination of blues, folk, rock, etc. I met only two people I already knew, which is very, very rare, but I got acquainted with a woman named Vicky on the bus going to the venue, and we palled around the whole day. Food and beverages were available for sale, catered by Longhorn Smokehouse. I didn’t indulge. It was a great afternoon and I was very glad that I attended. 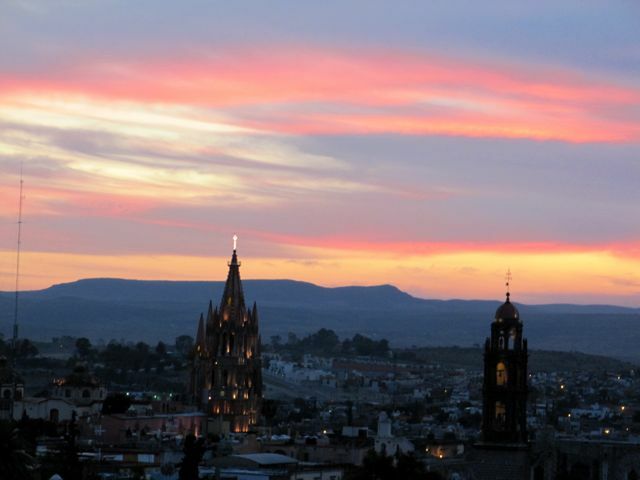 And thus, another extraordinary time in San Miguel de Allende ends, but certainly not my love affair with the place. Stay tuned.